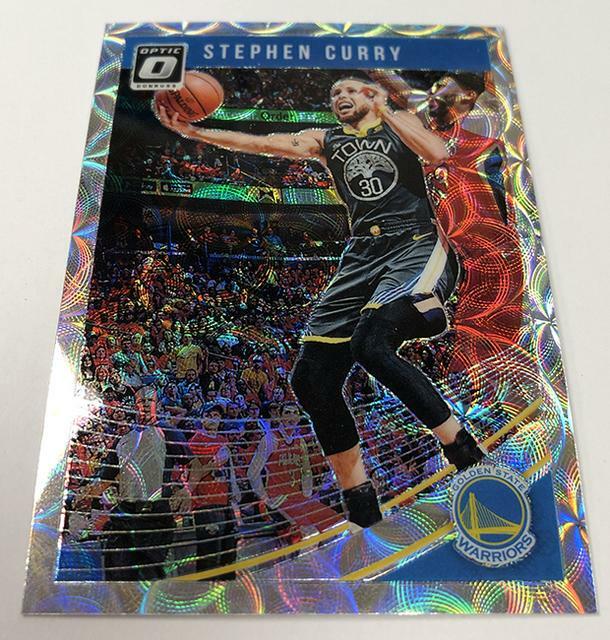 in-demand single cards on the market. 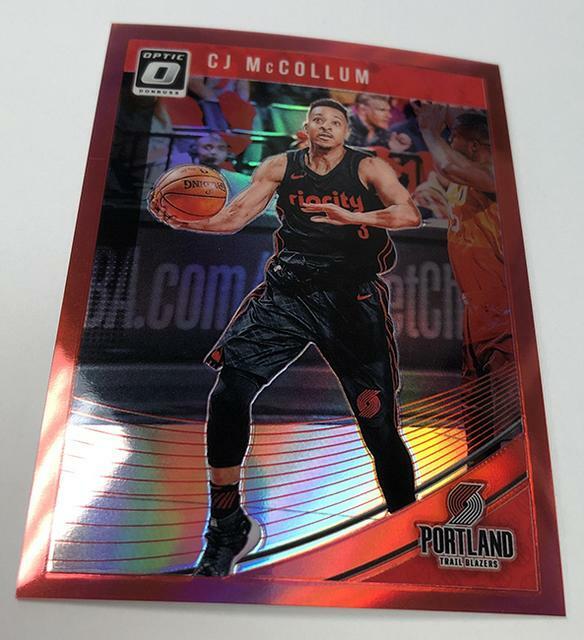 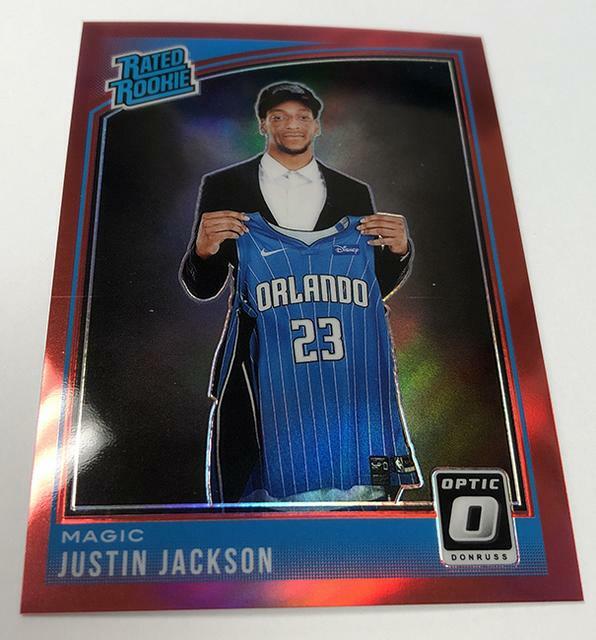 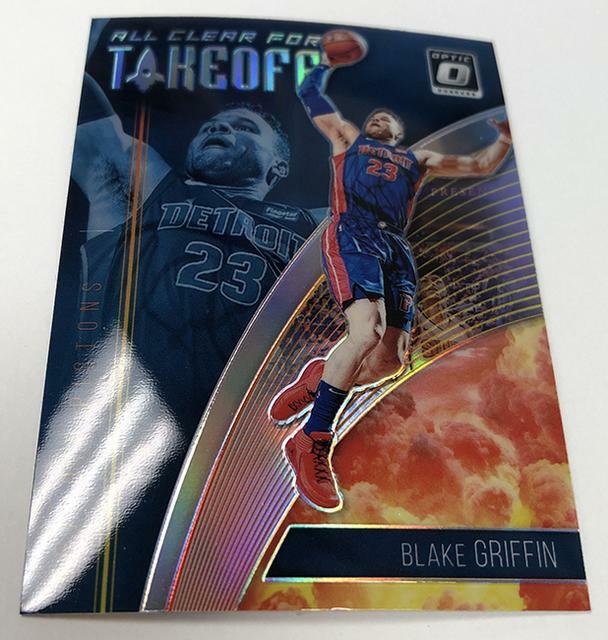 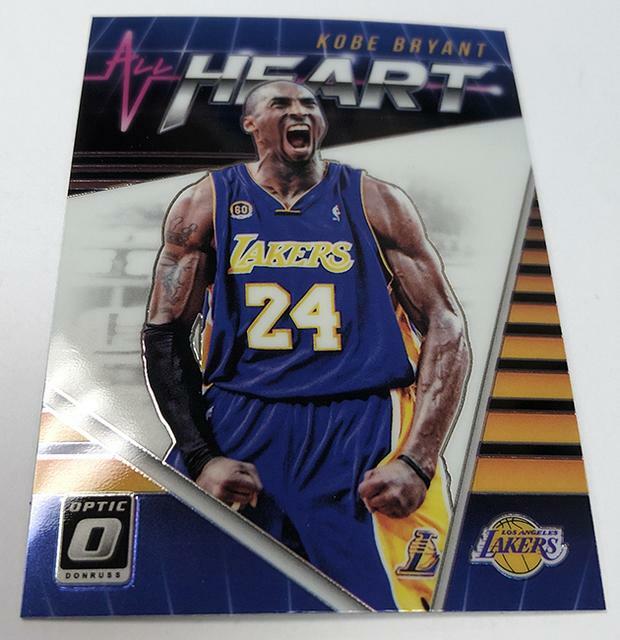 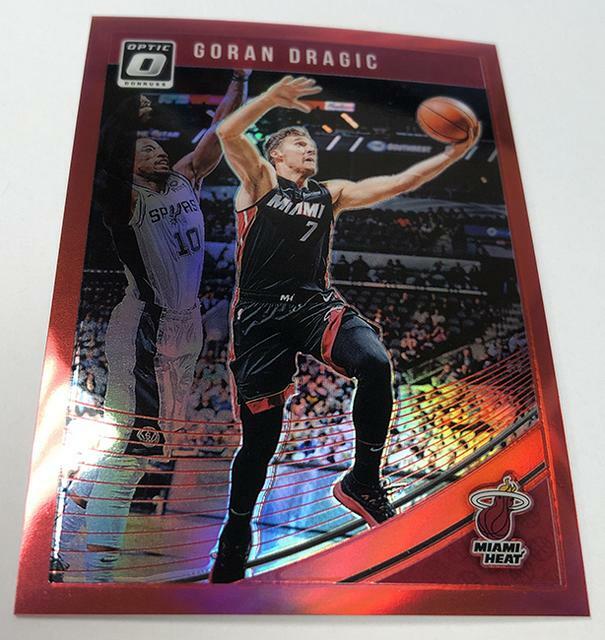 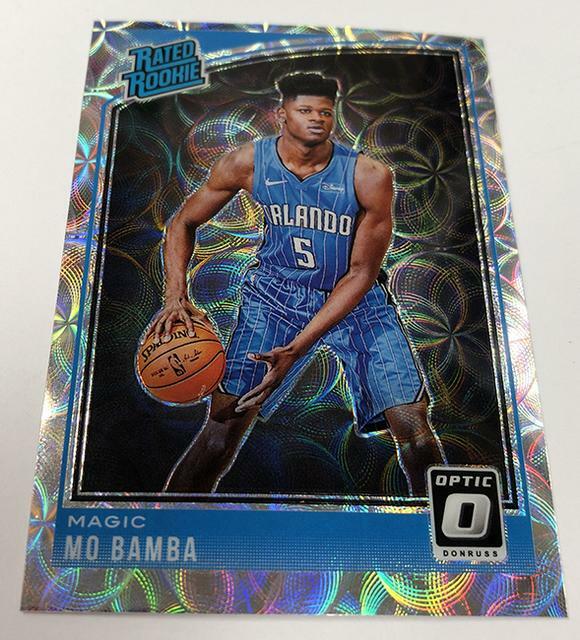 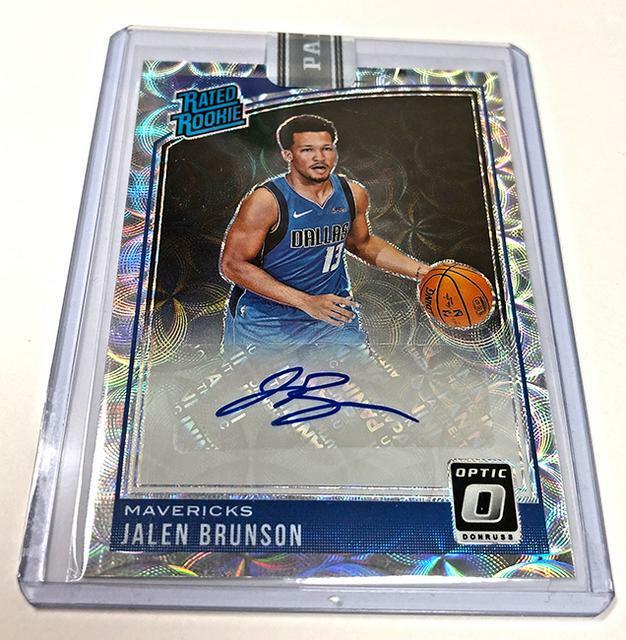 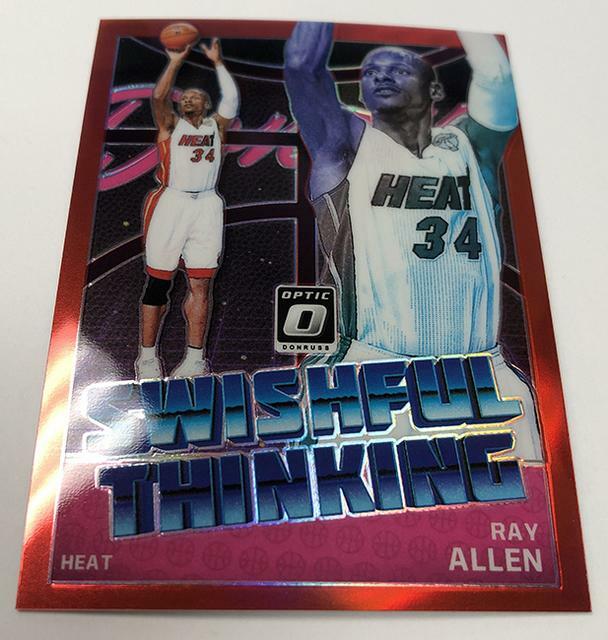 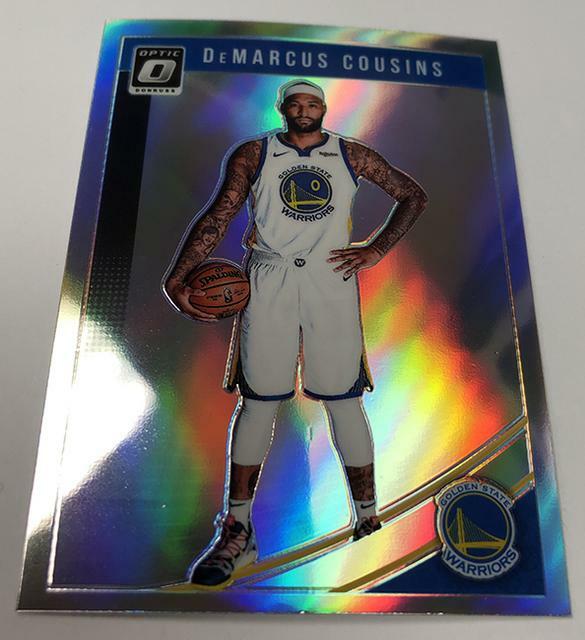 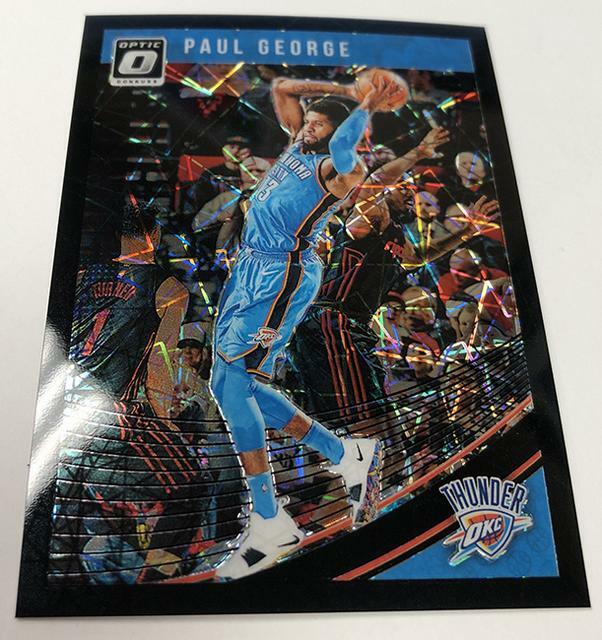 with the release of 2018-19 Donruss Optic. 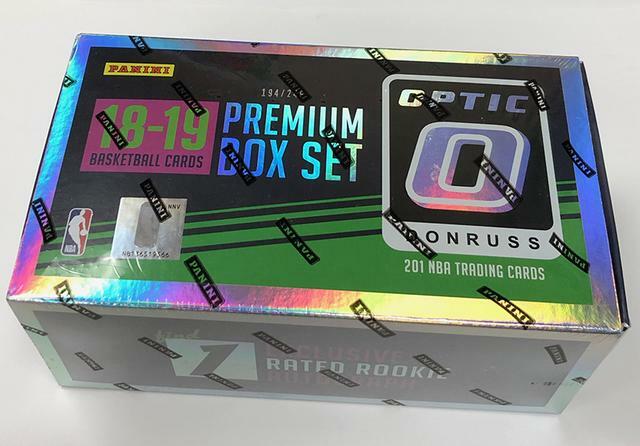 (four cards per pack, 20 packs per box, 12 boxes per case). 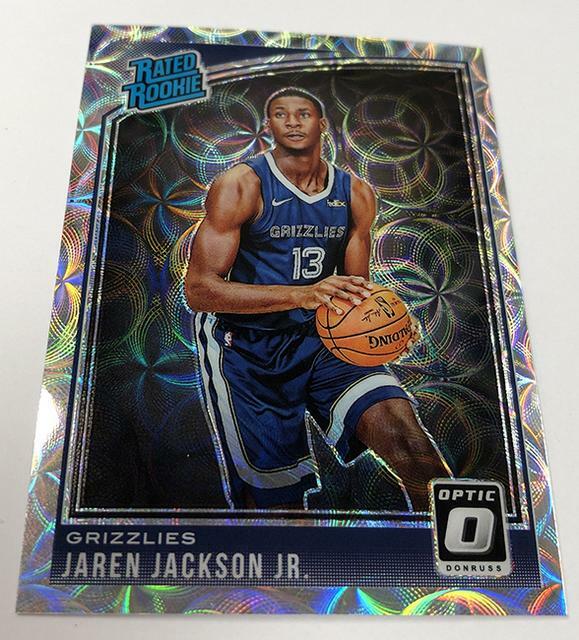 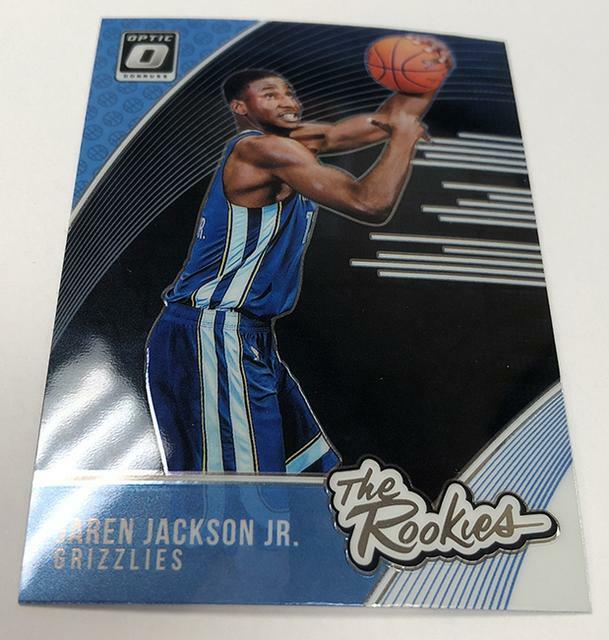 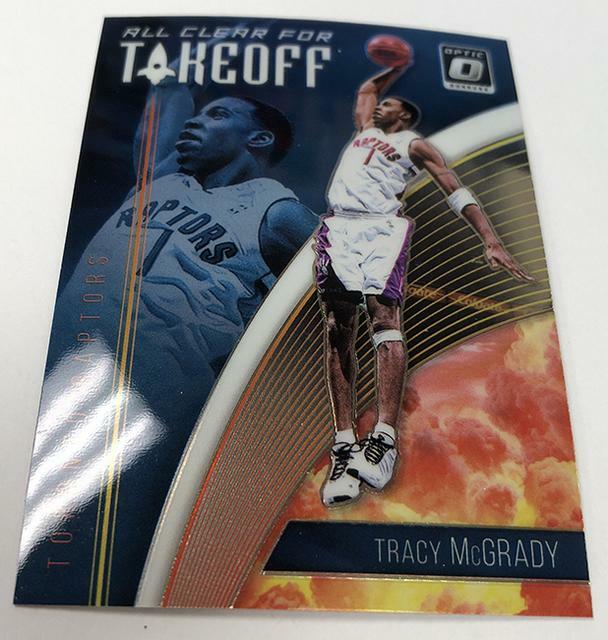 2018-19 Donruss Optic Rated Rookie JAREN JACKSON Jr.
2018-19 Donruss Optic Rated Rookie TROY BROWN Jr.
2018-19 Donruss Optic The Rookies JAREN JACKSON Jr.
2018-19 Donruss Optic All Clear For Takeoff LARRY NANCE Jr.
2018-19 Donruss Optic Rated Rookie Autographs WENDELL CARTER Jr.
2018-19 Donruss Optic Rated Rookie Autographs GARY TRENT Jr.
Dernière modification par Eyeshield21 le 13 mars 2019, 10:59, modifié 1 fois. 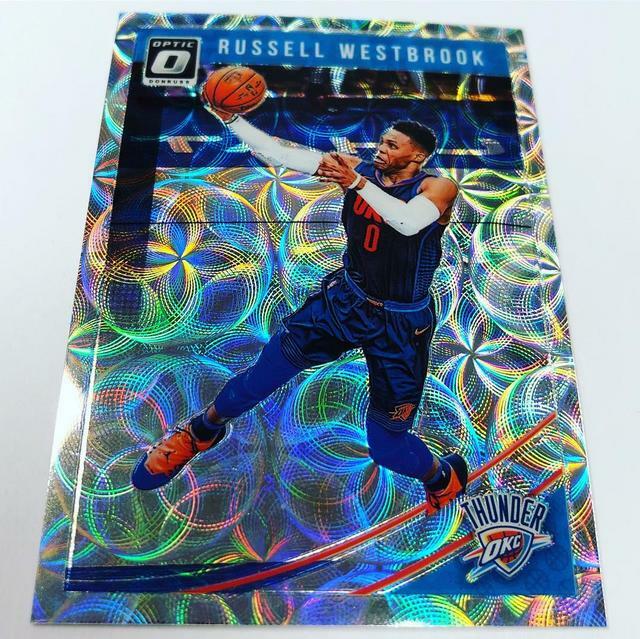 2018 Limited Football and 2018-19 Donruss Optic . 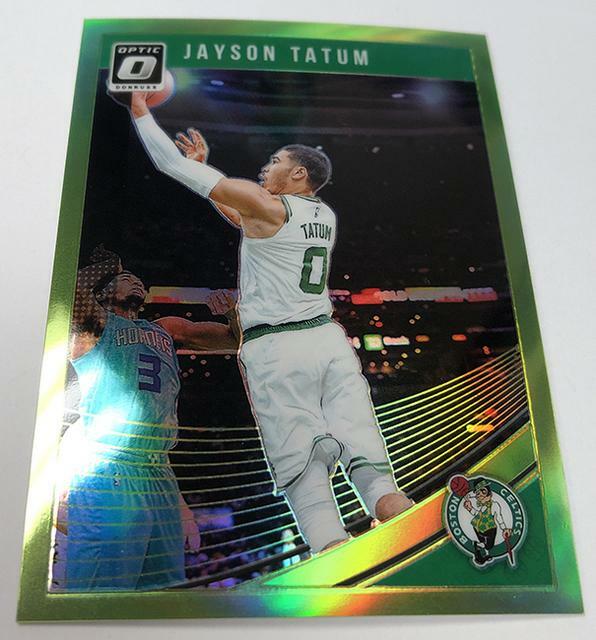 that typically arrive just before release day. 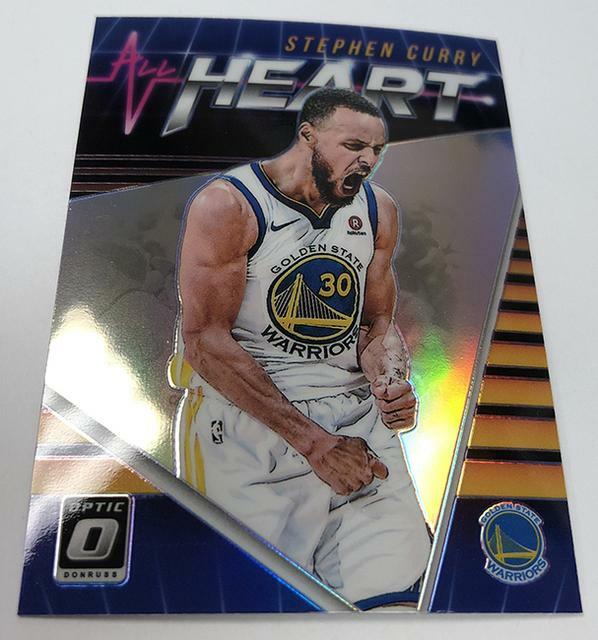 We began with 2018 Limited Football earlier today. 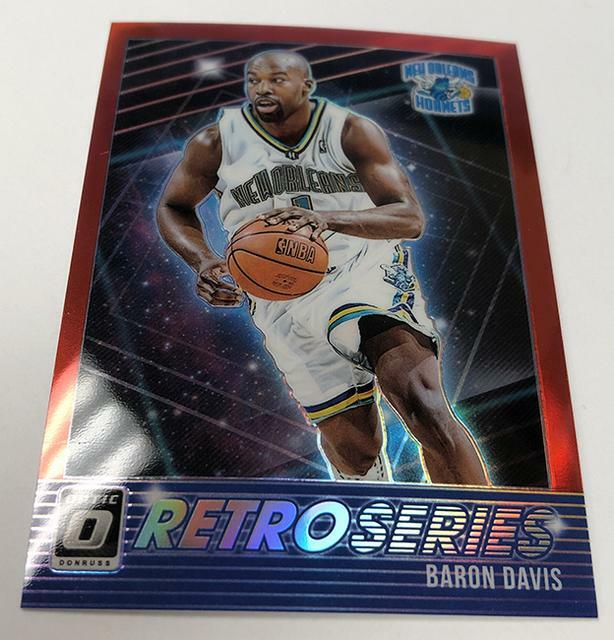 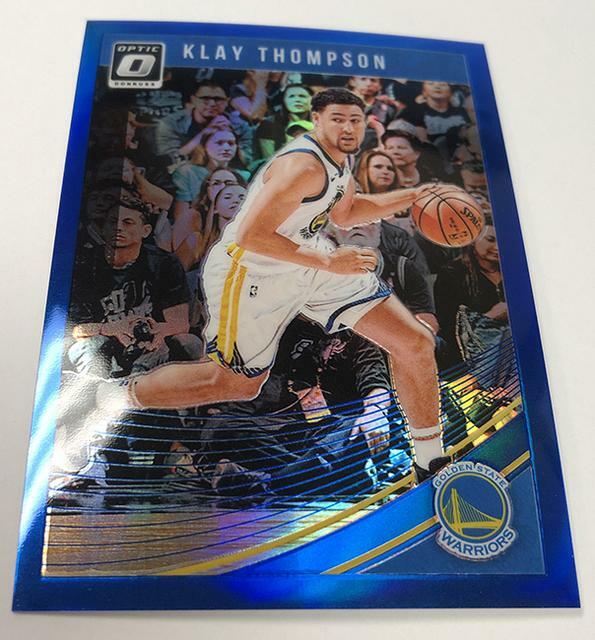 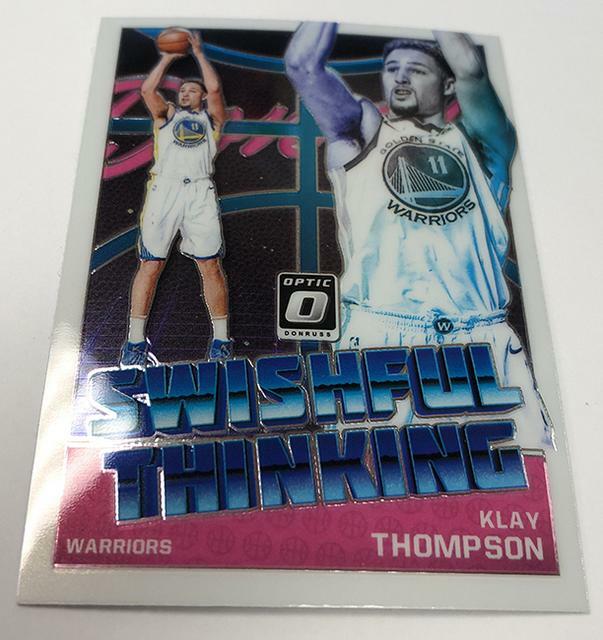 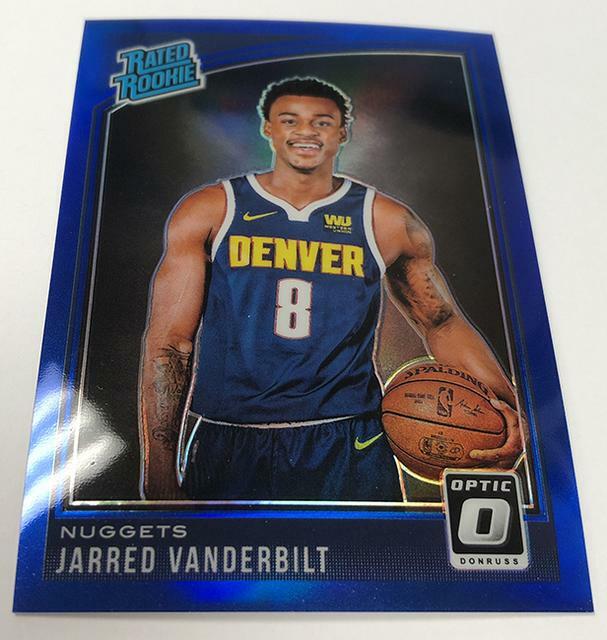 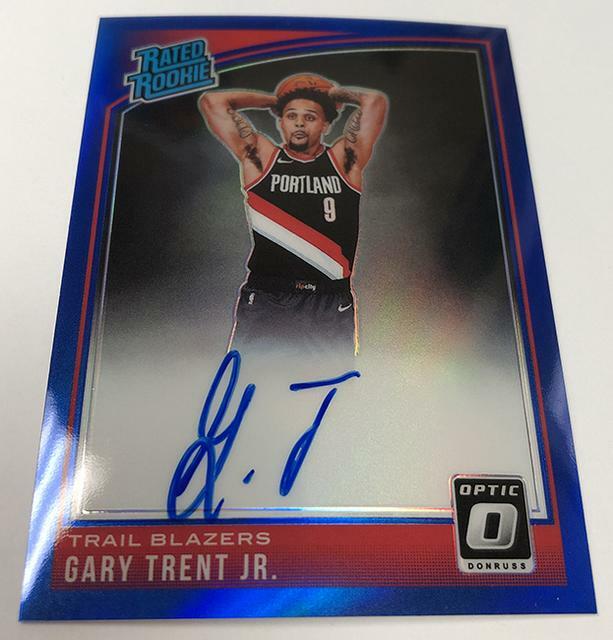 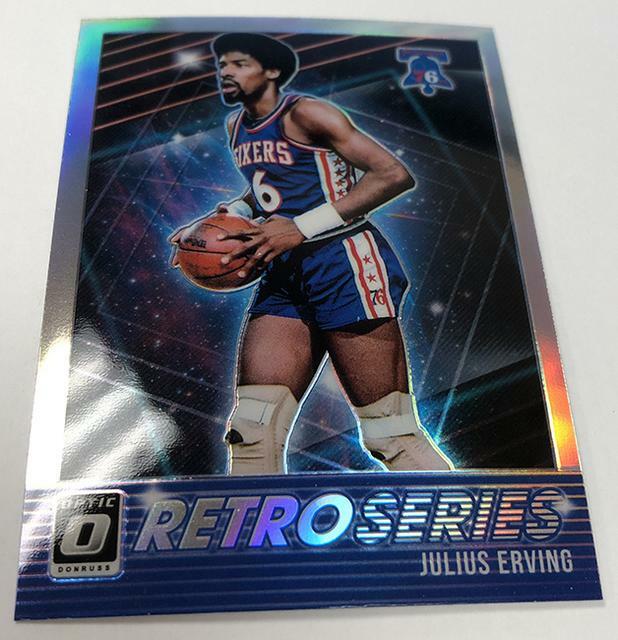 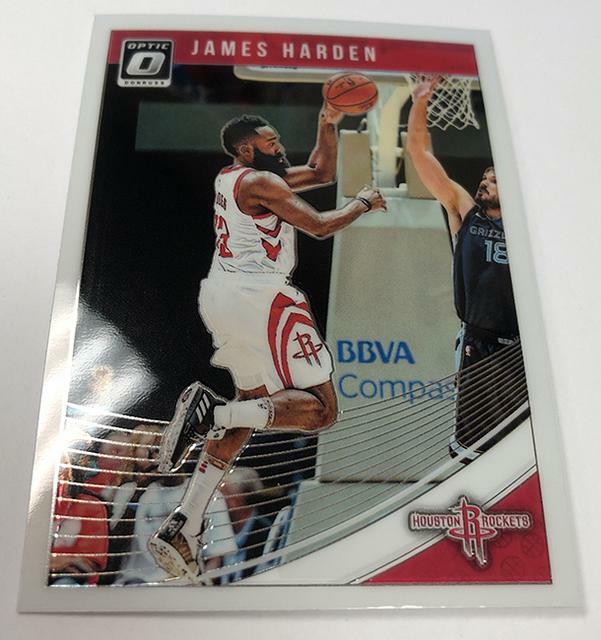 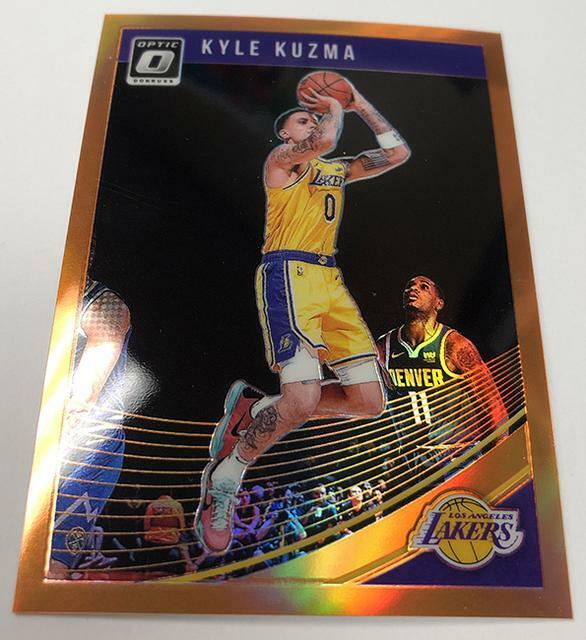 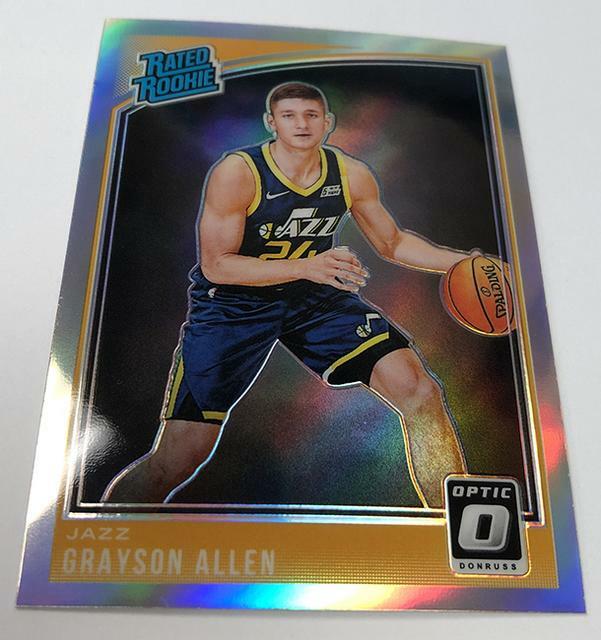 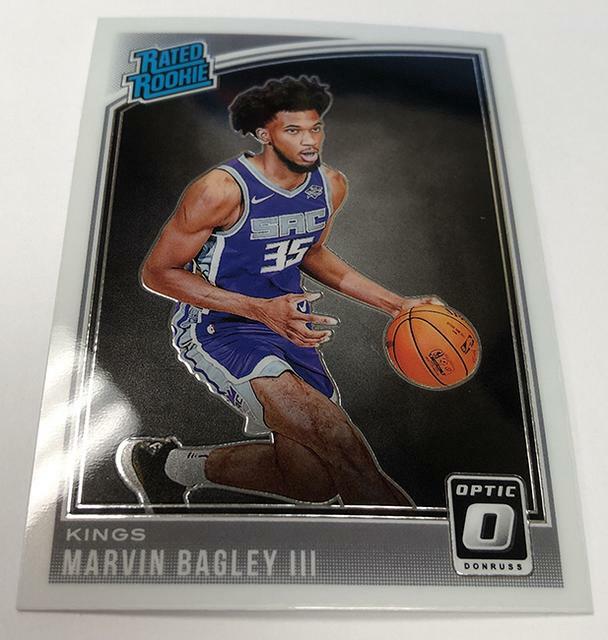 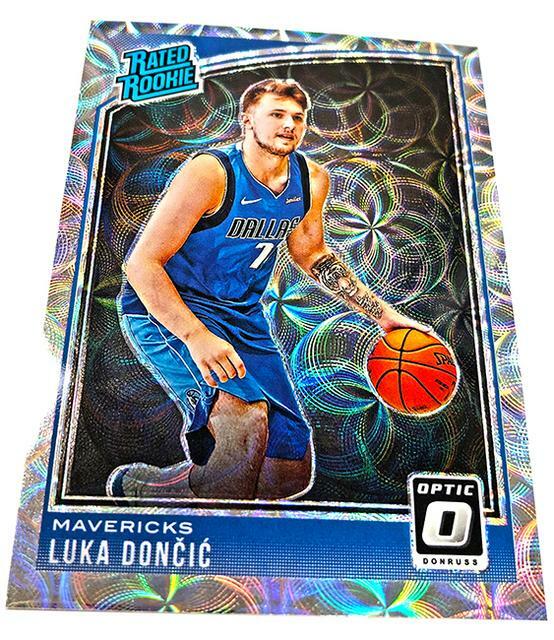 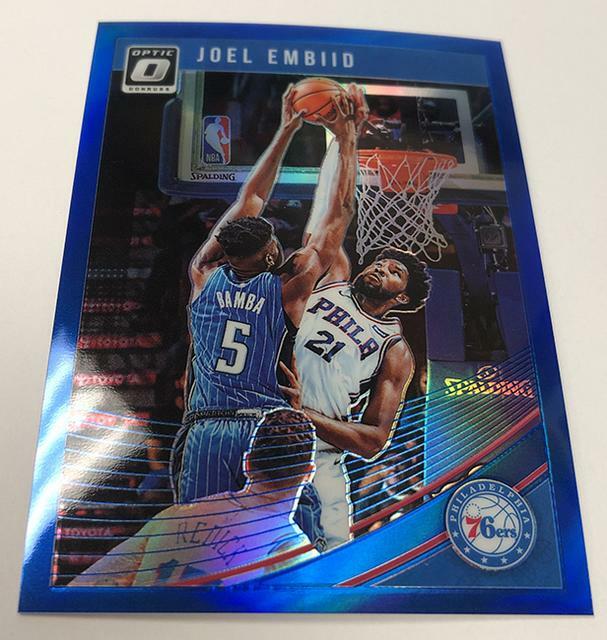 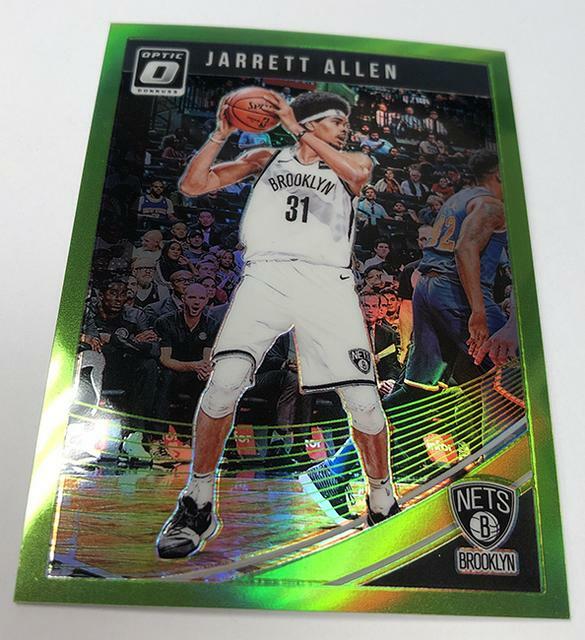 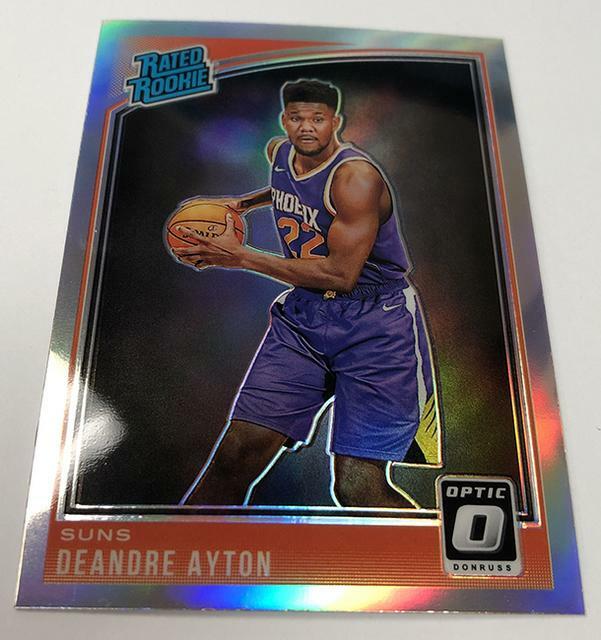 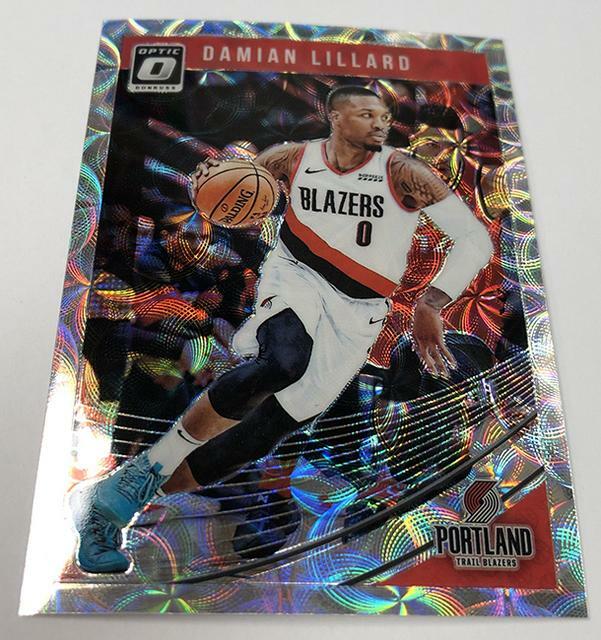 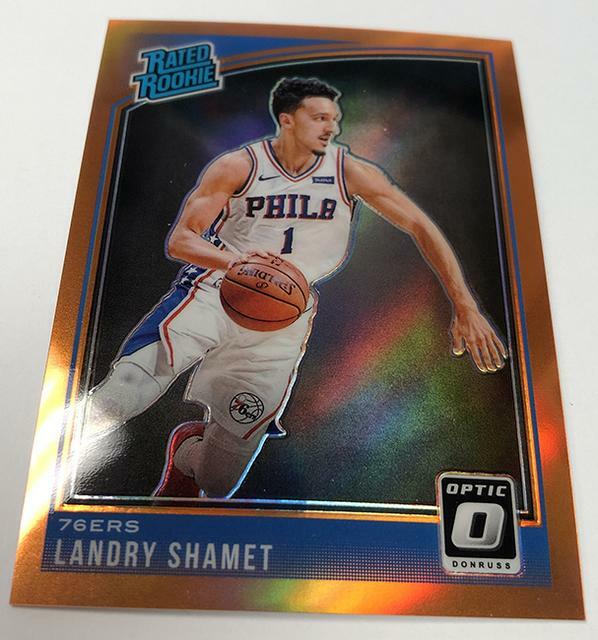 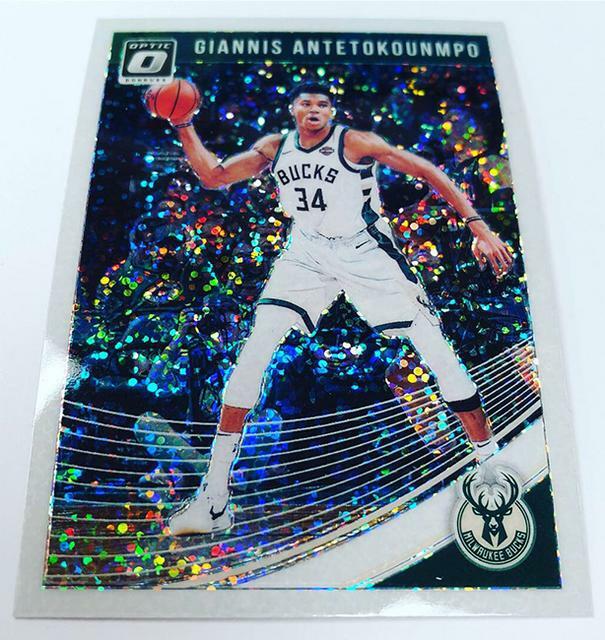 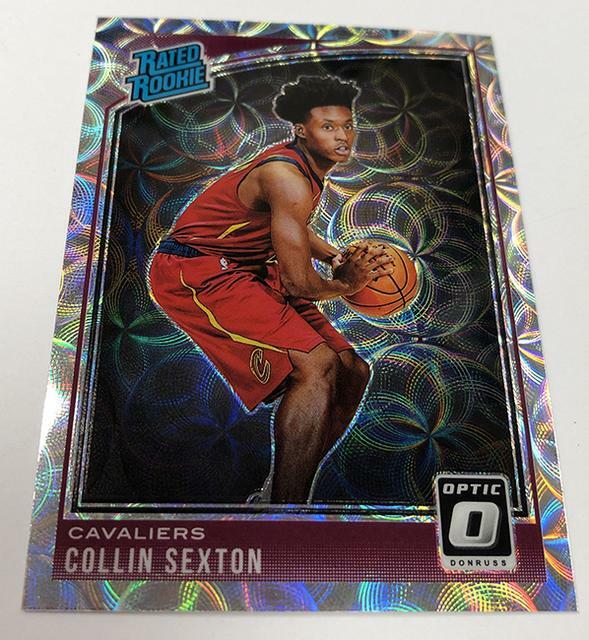 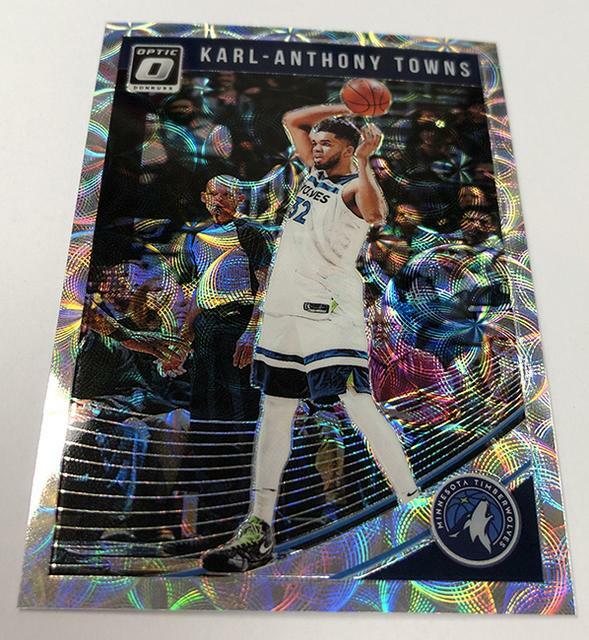 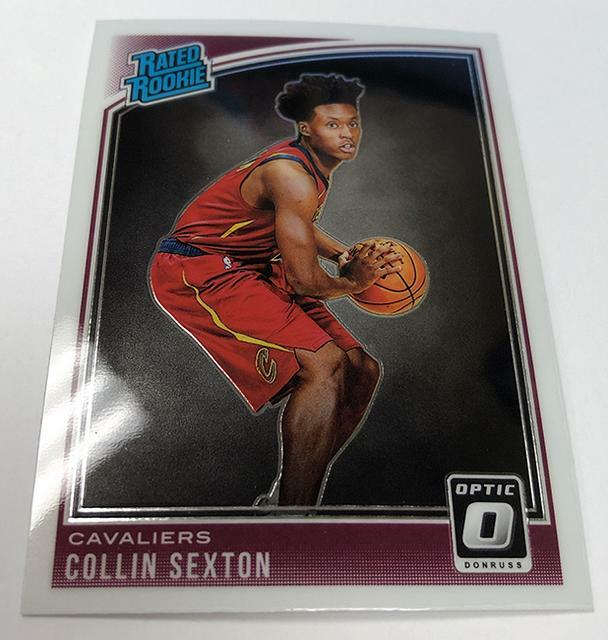 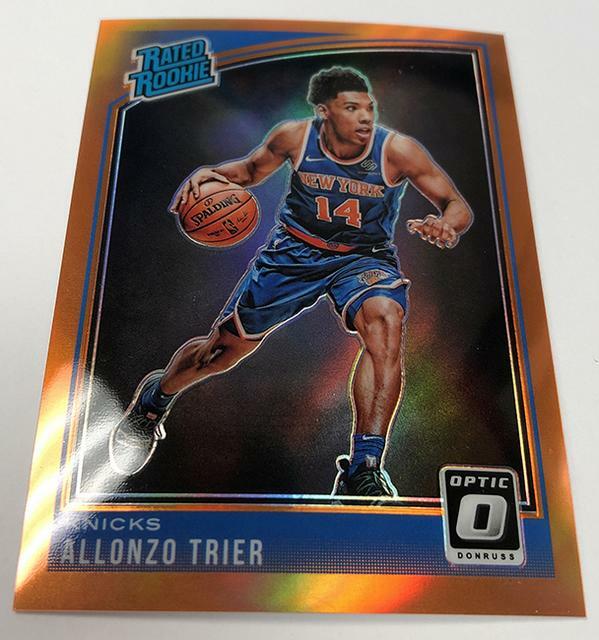 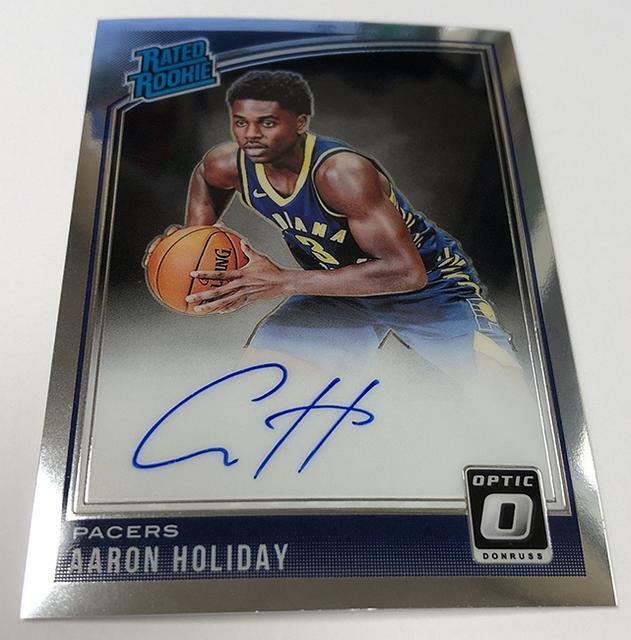 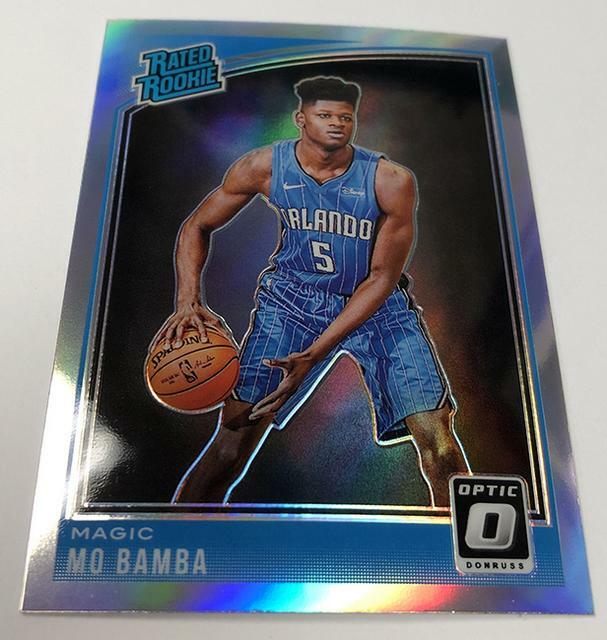 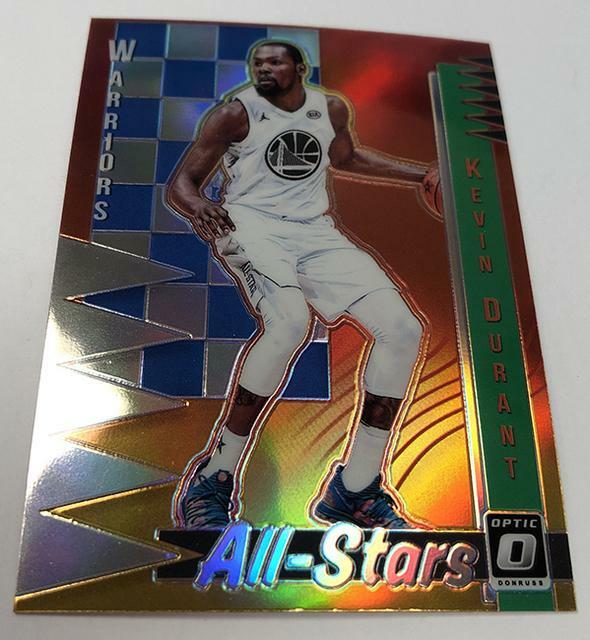 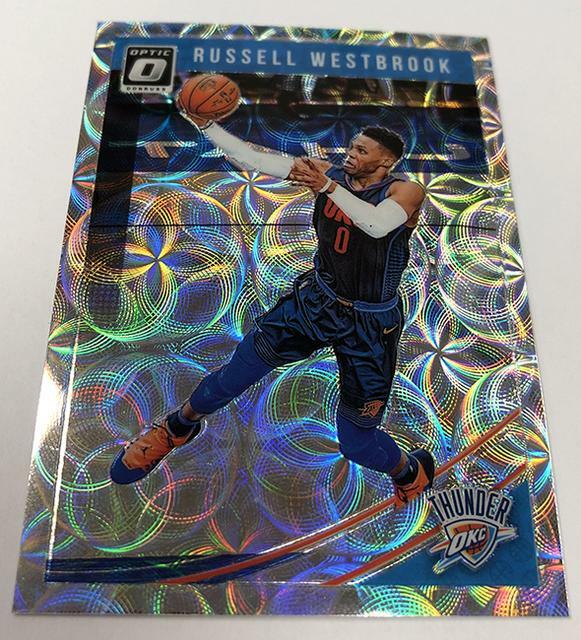 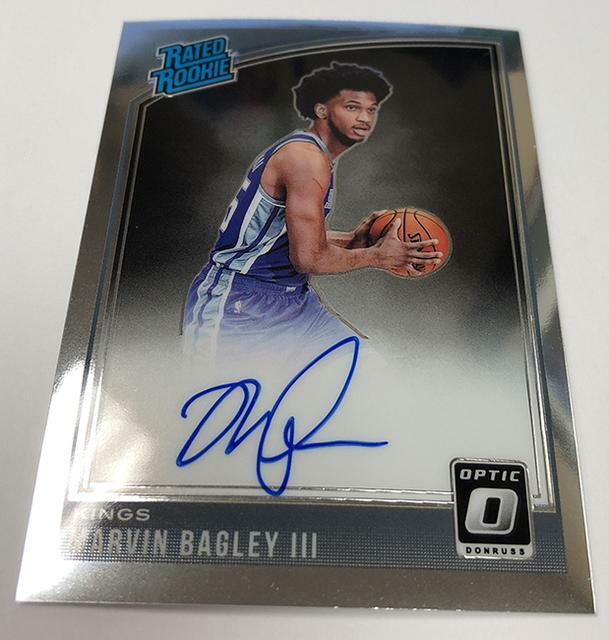 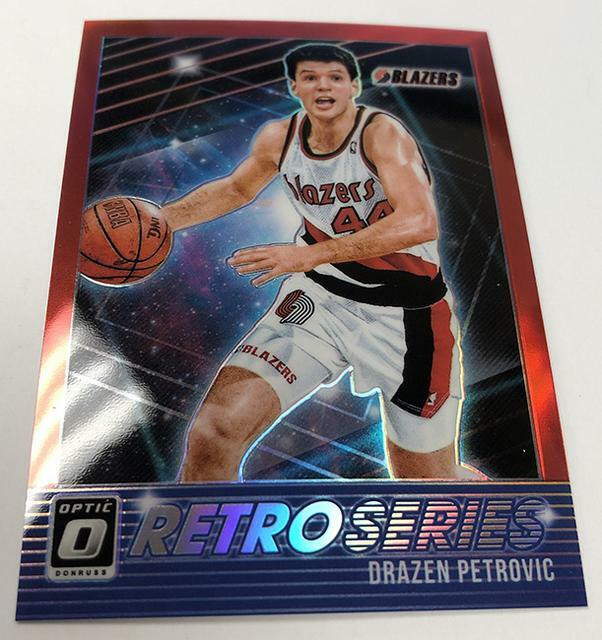 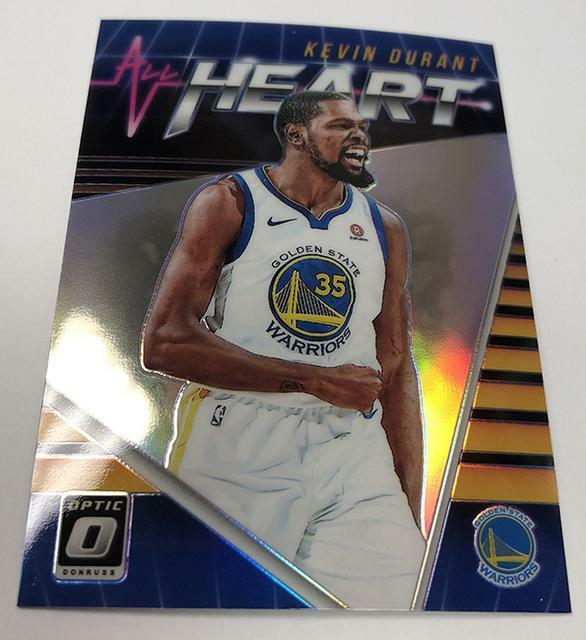 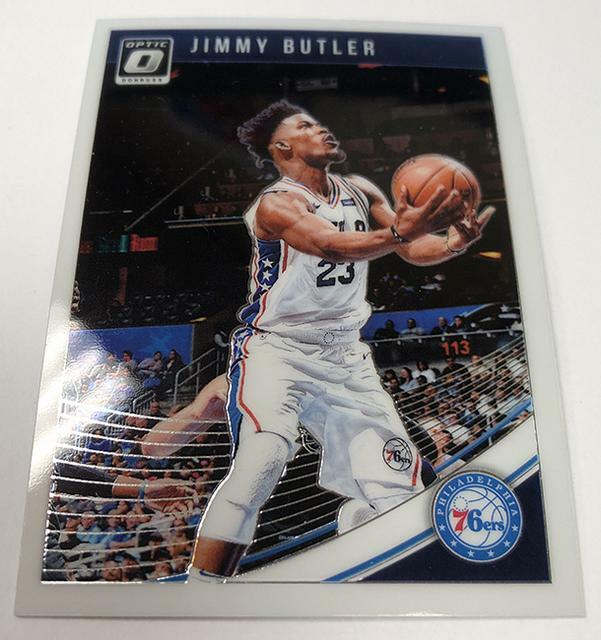 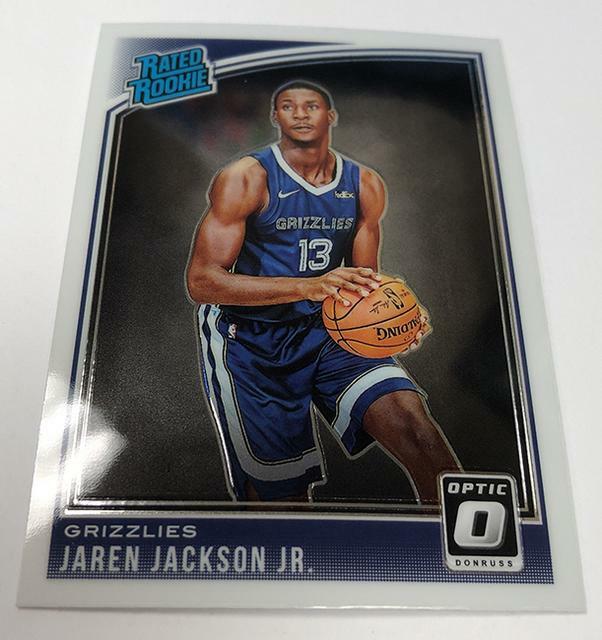 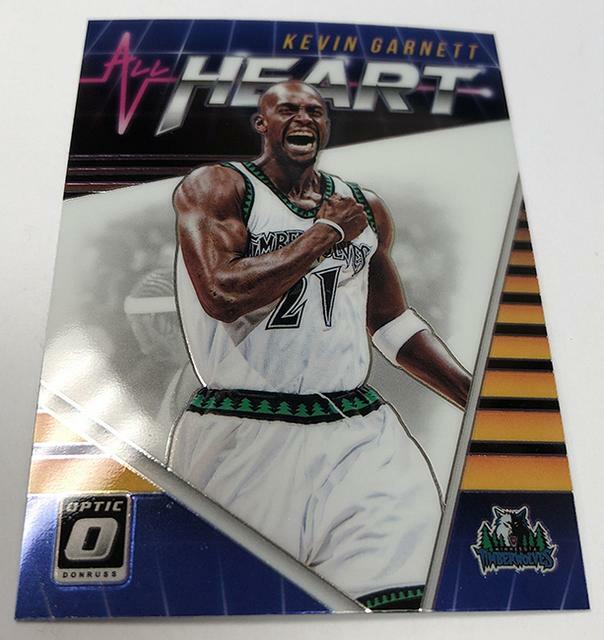 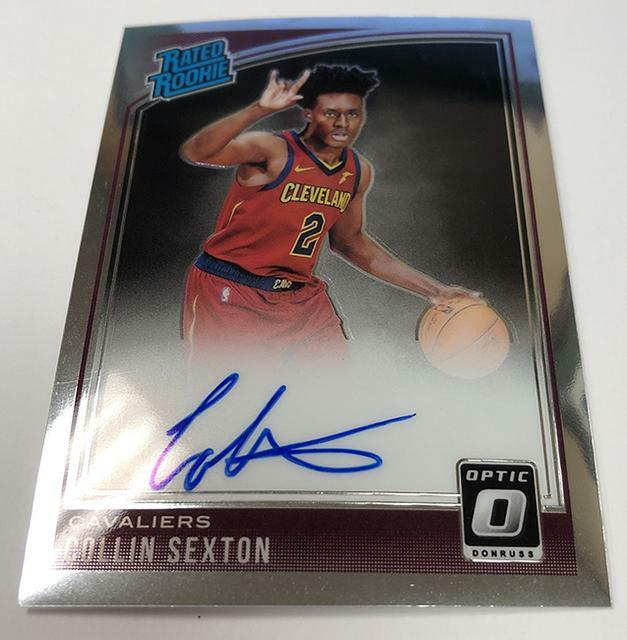 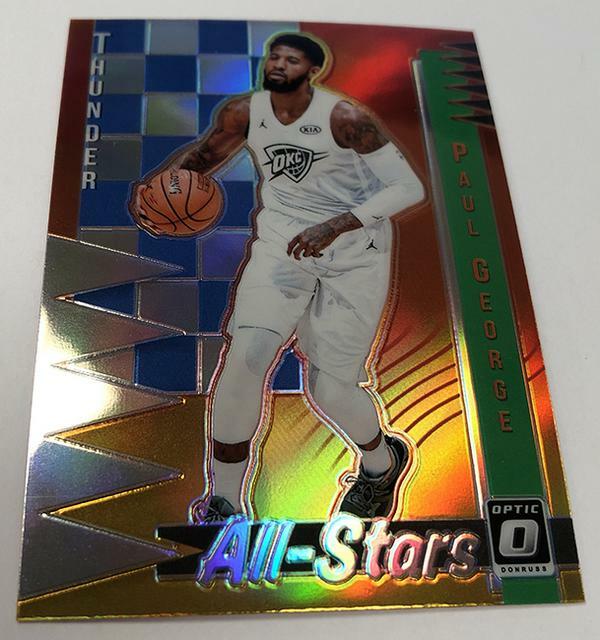 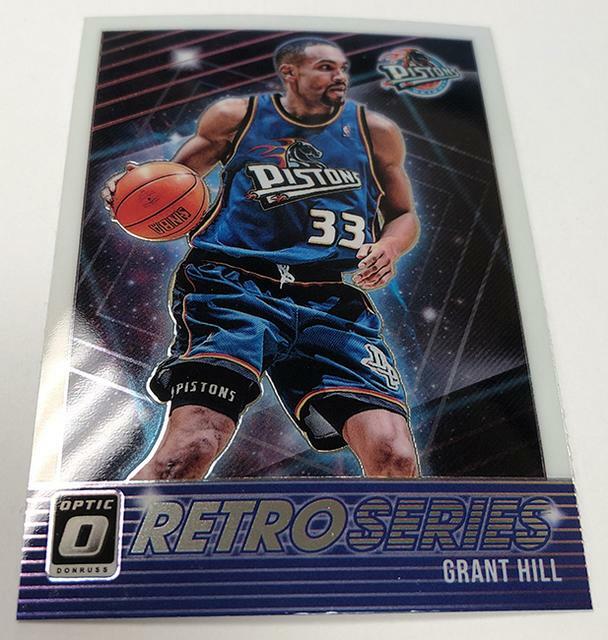 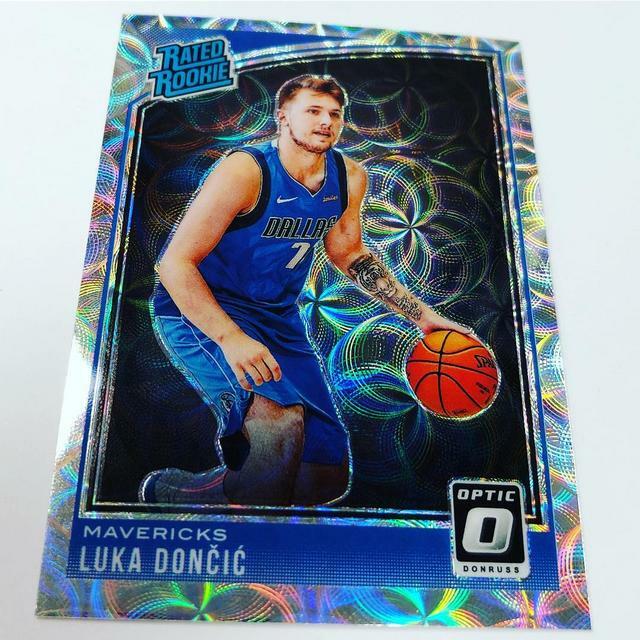 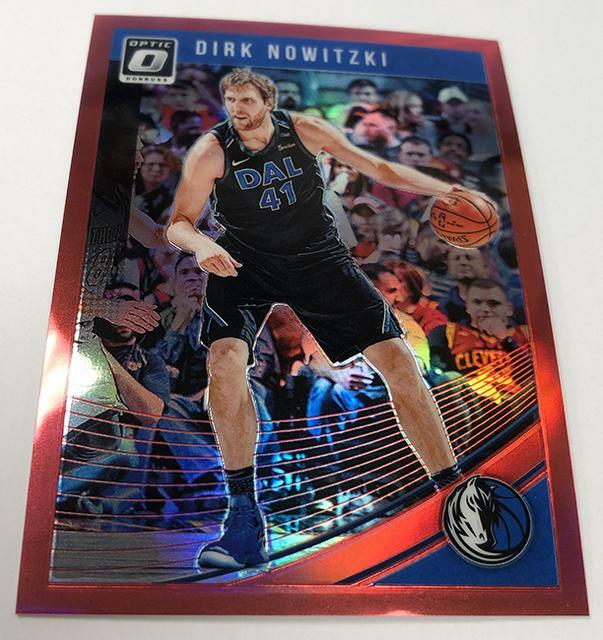 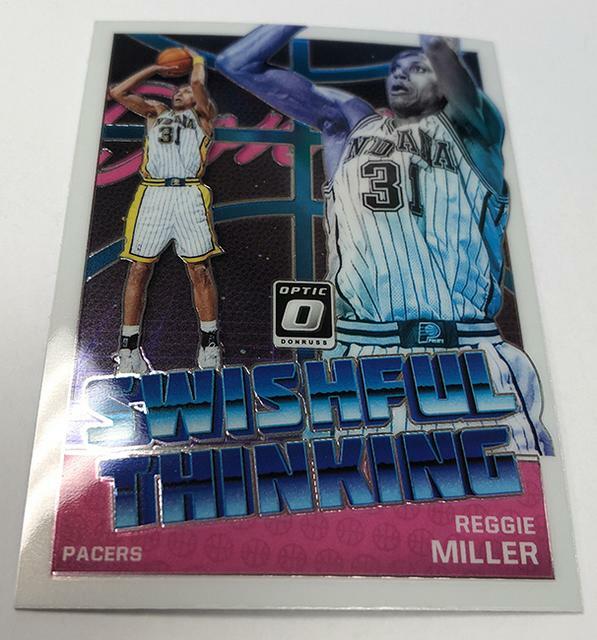 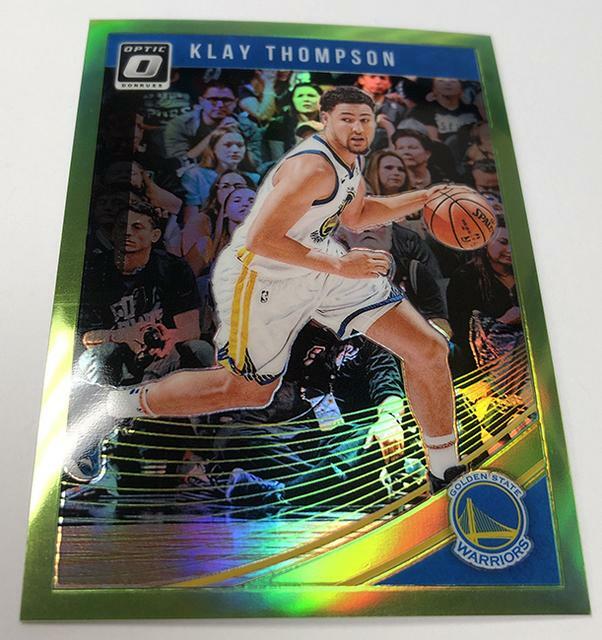 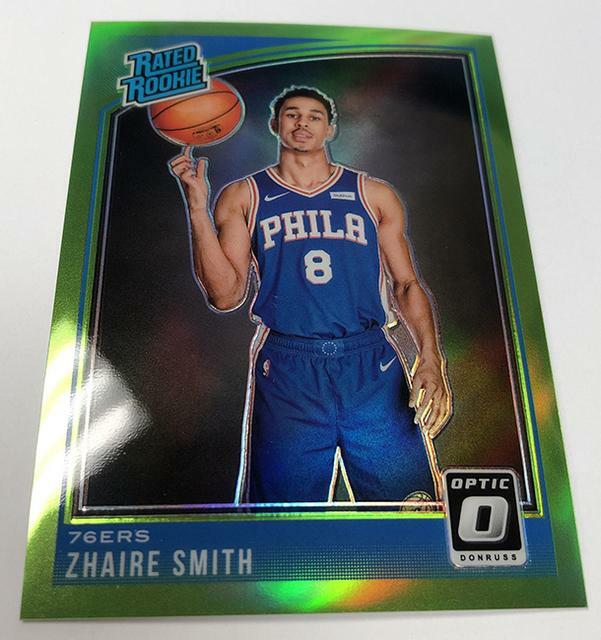 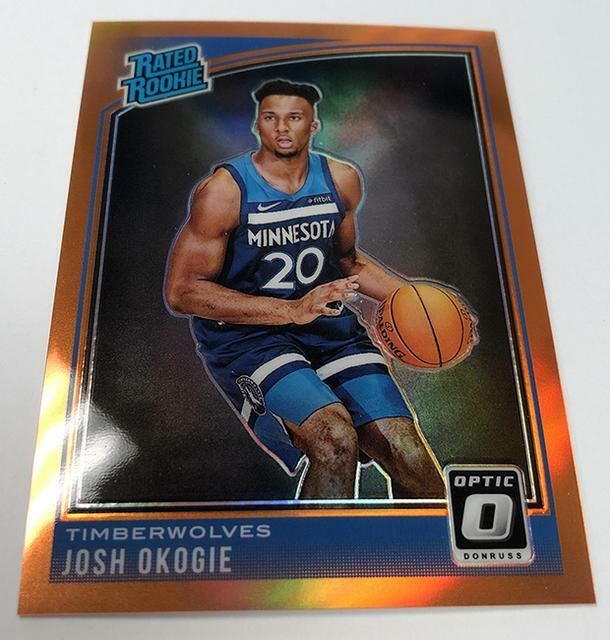 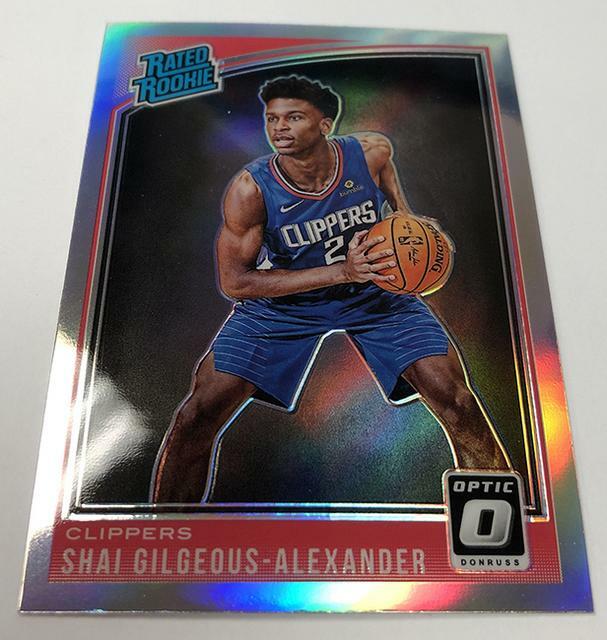 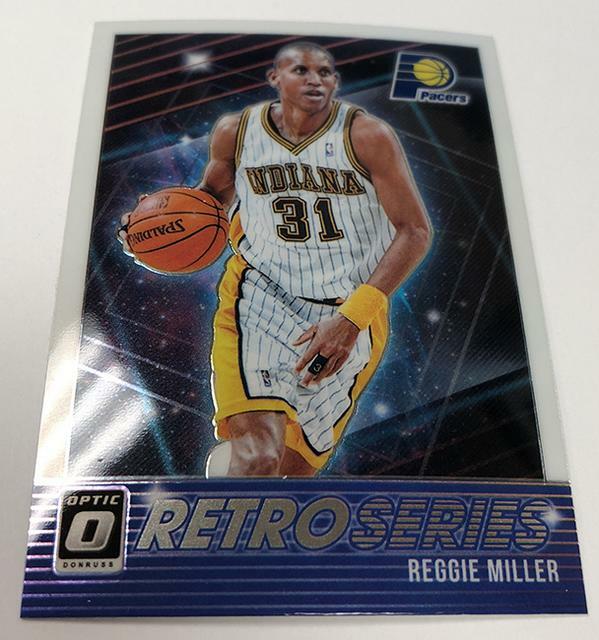 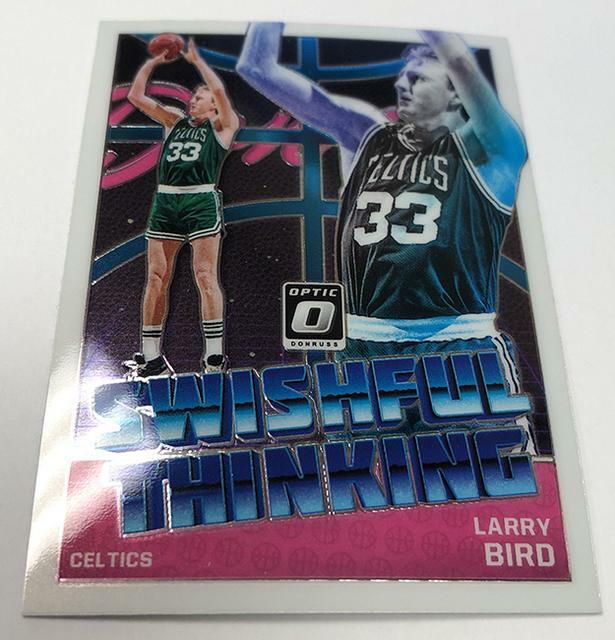 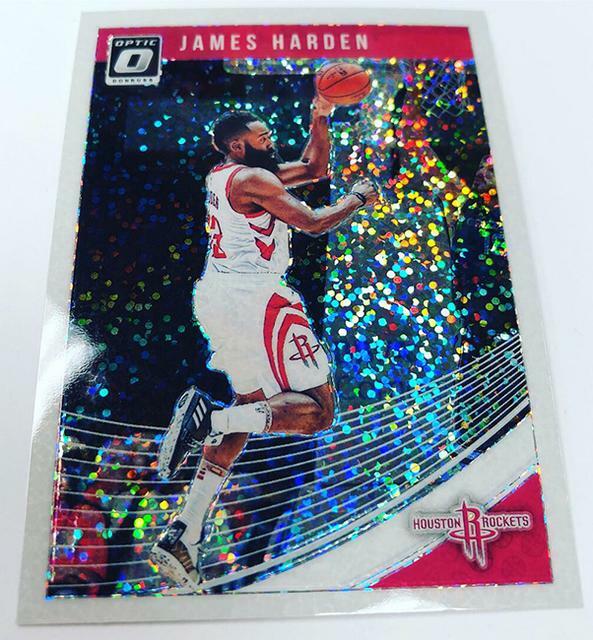 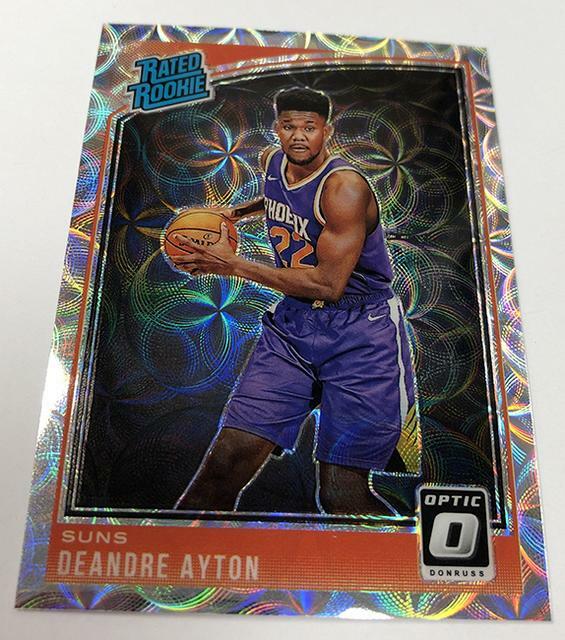 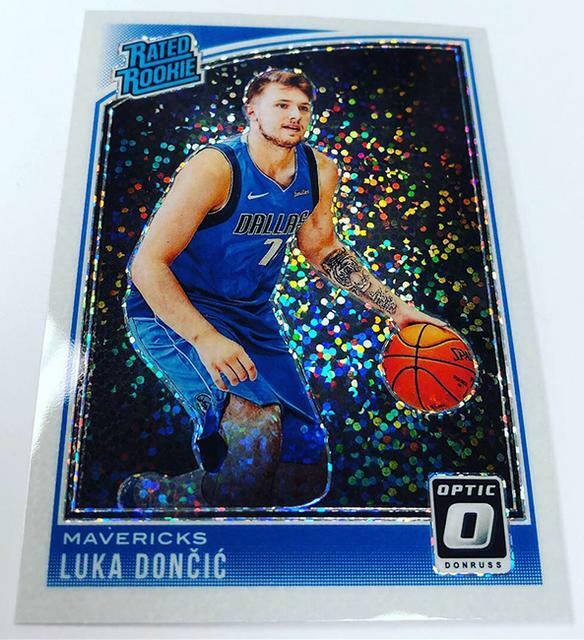 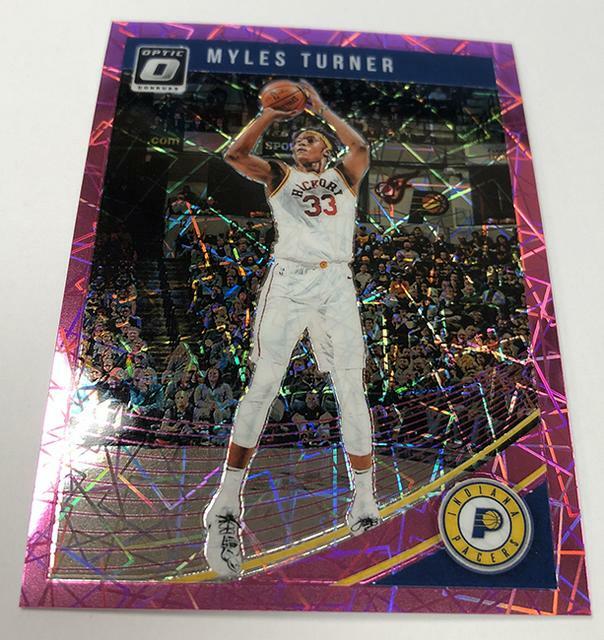 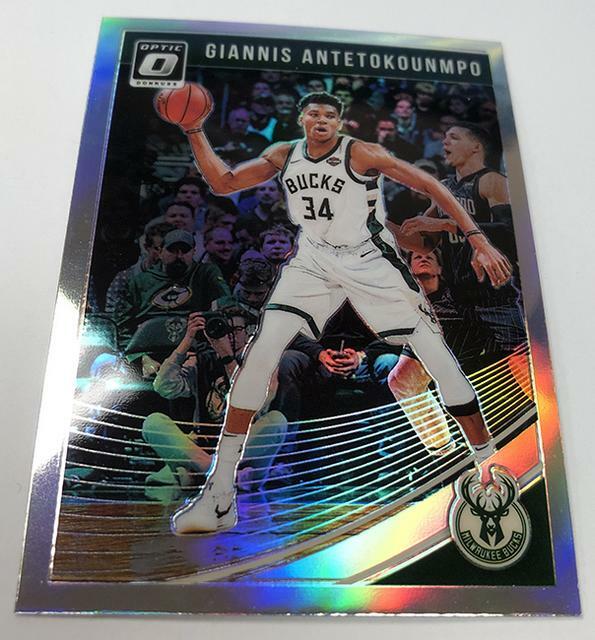 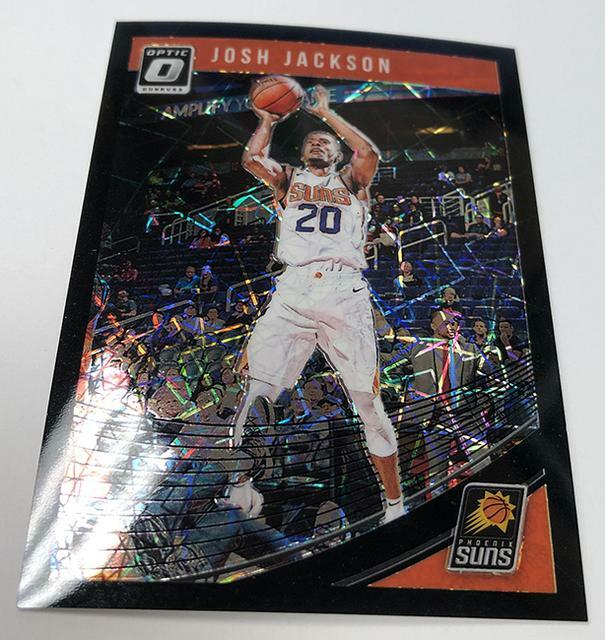 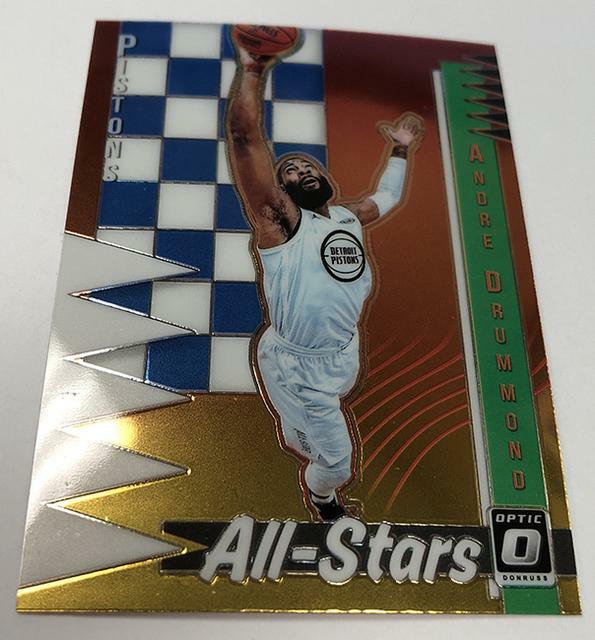 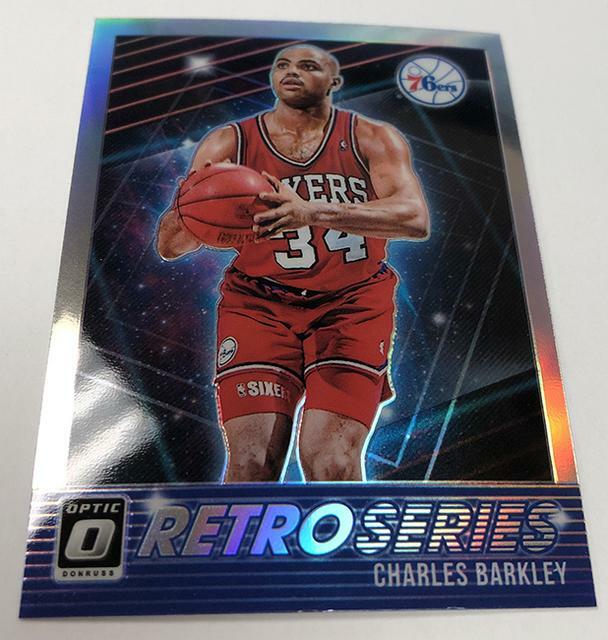 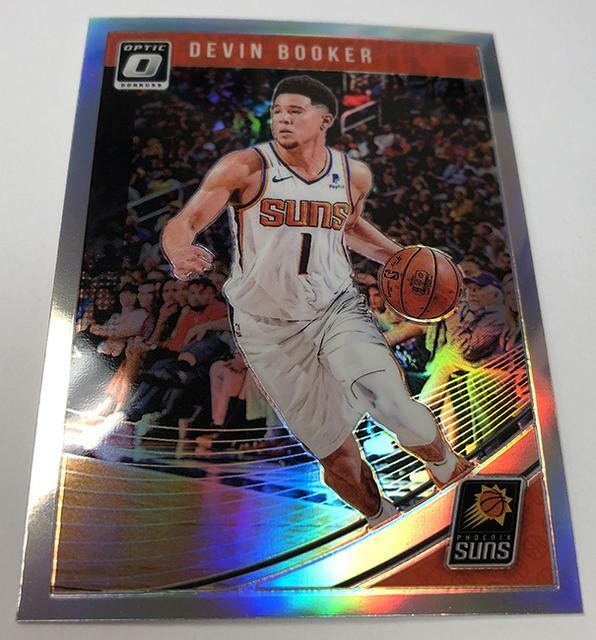 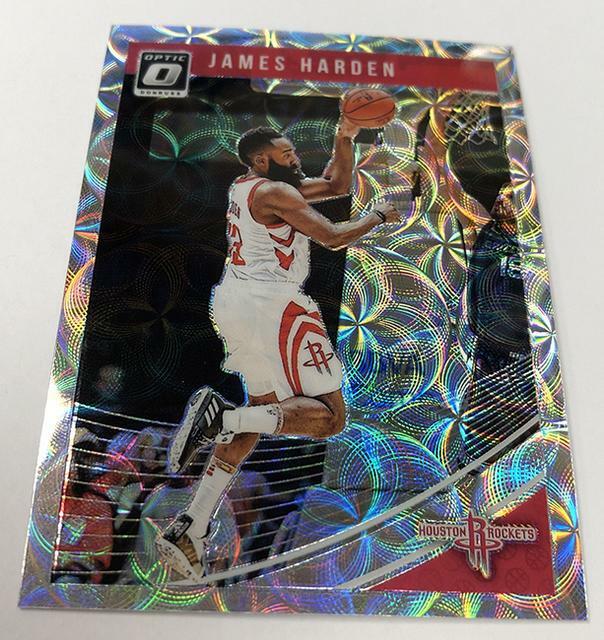 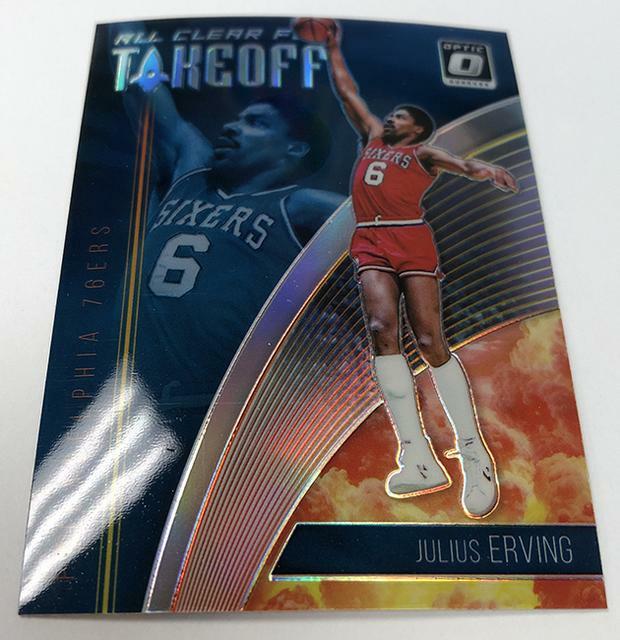 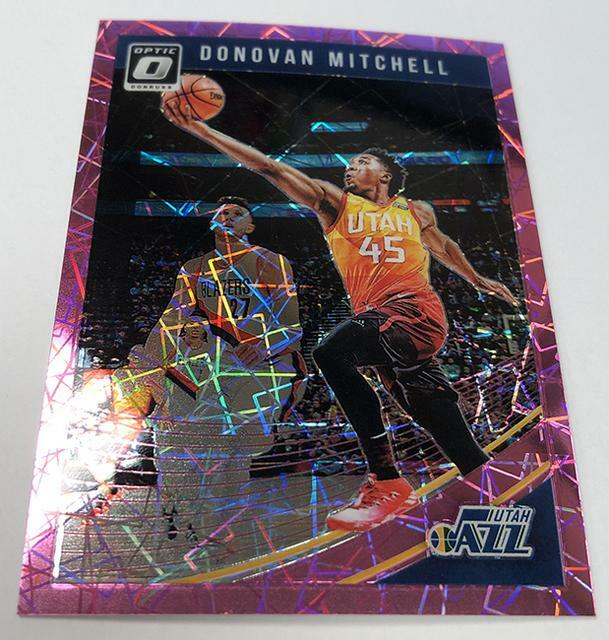 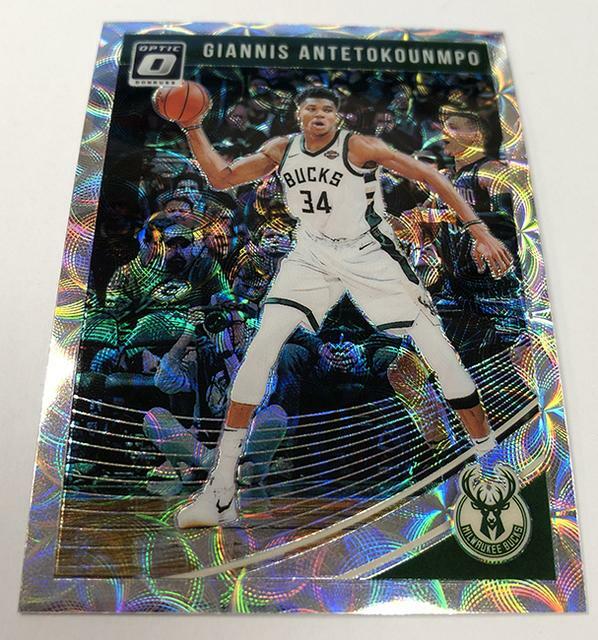 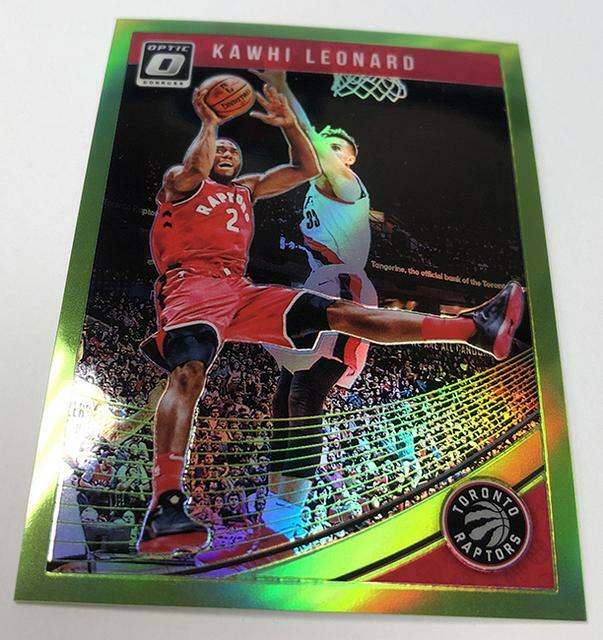 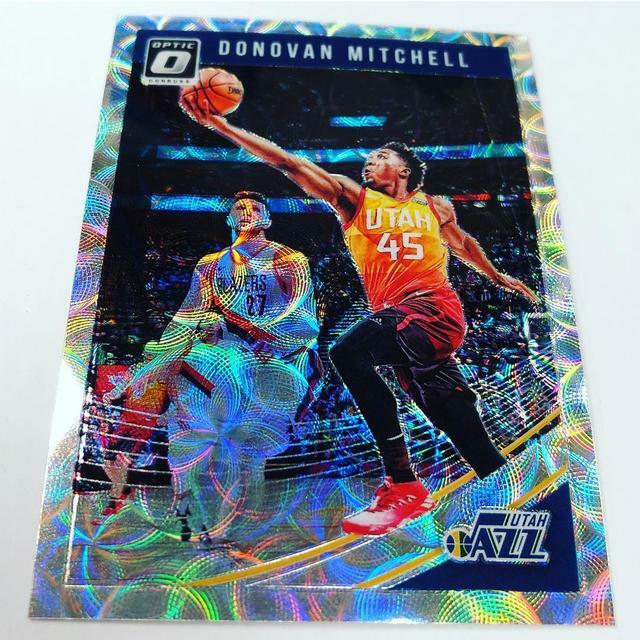 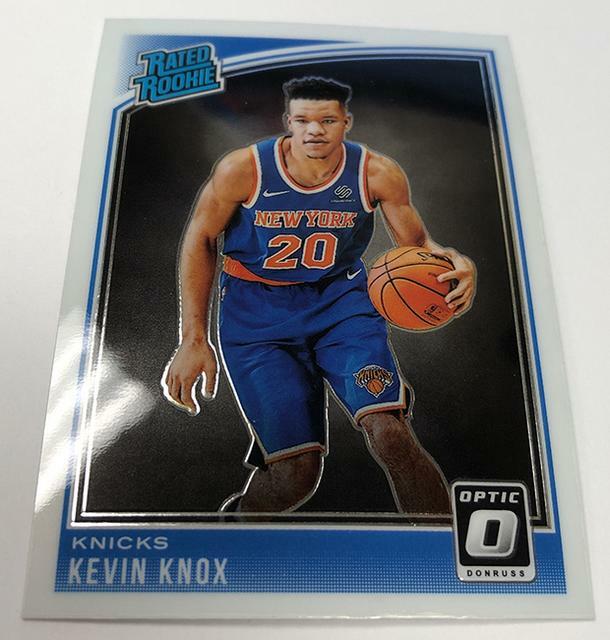 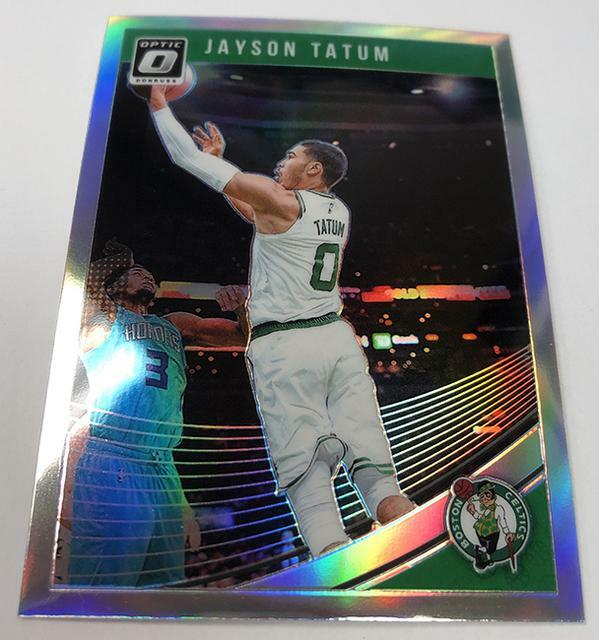 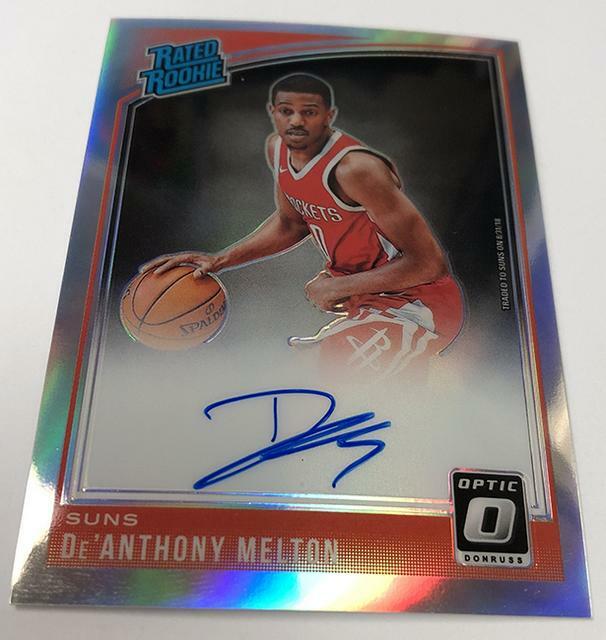 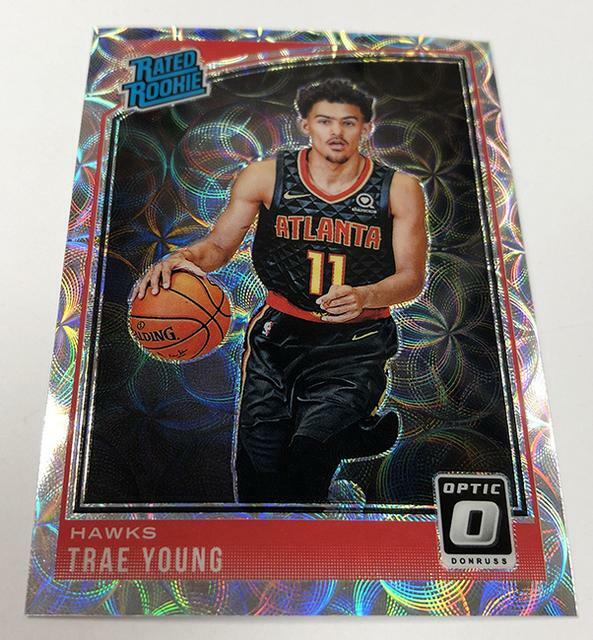 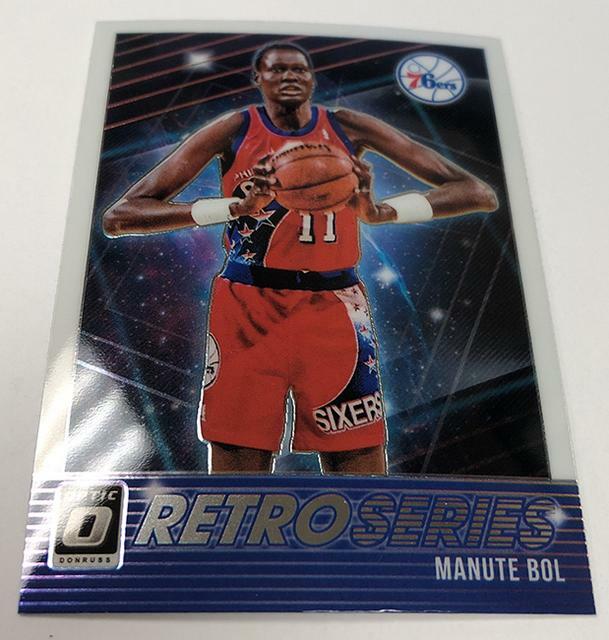 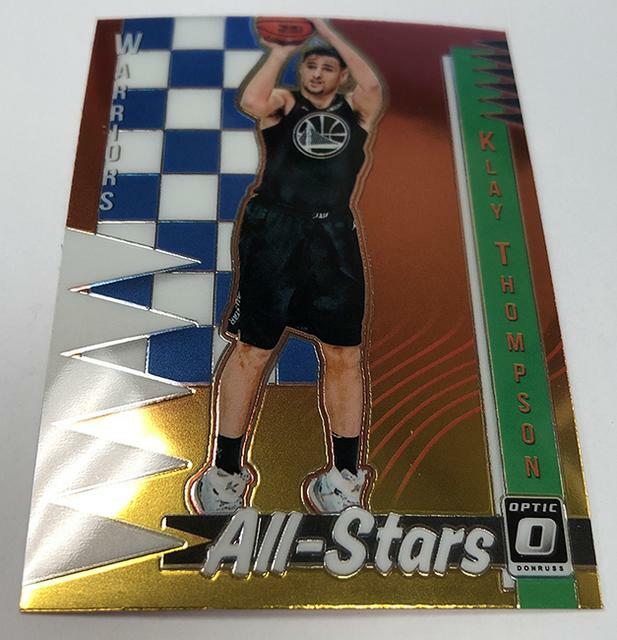 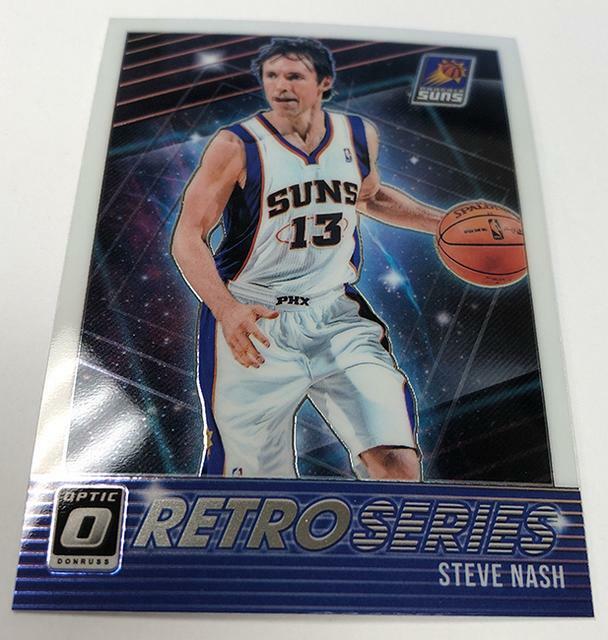 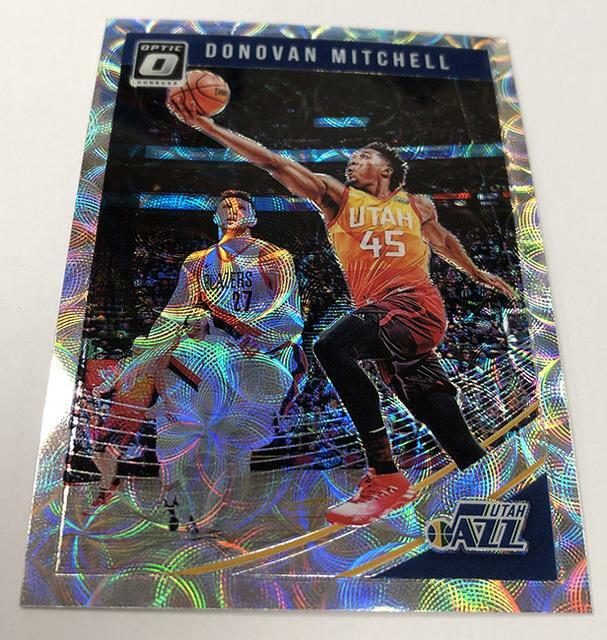 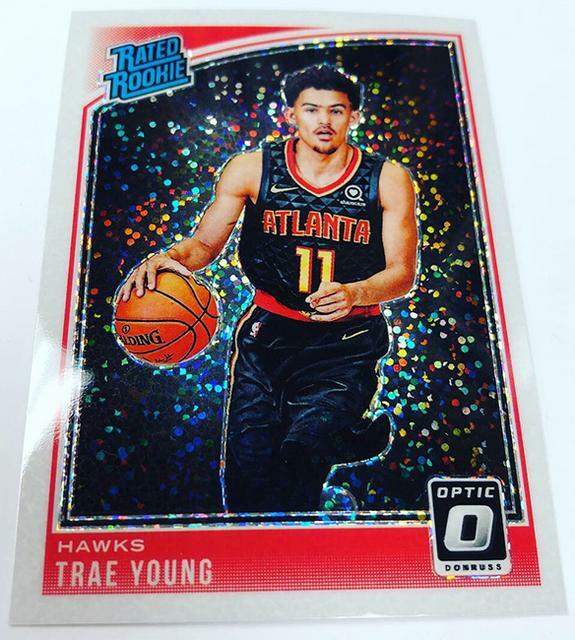 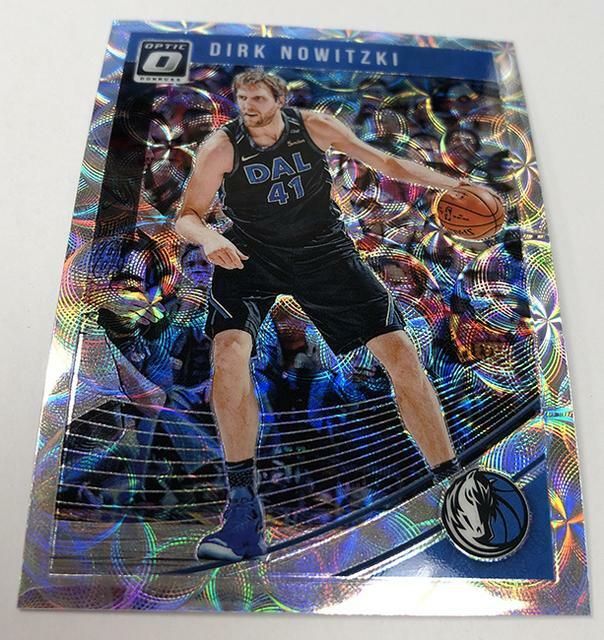 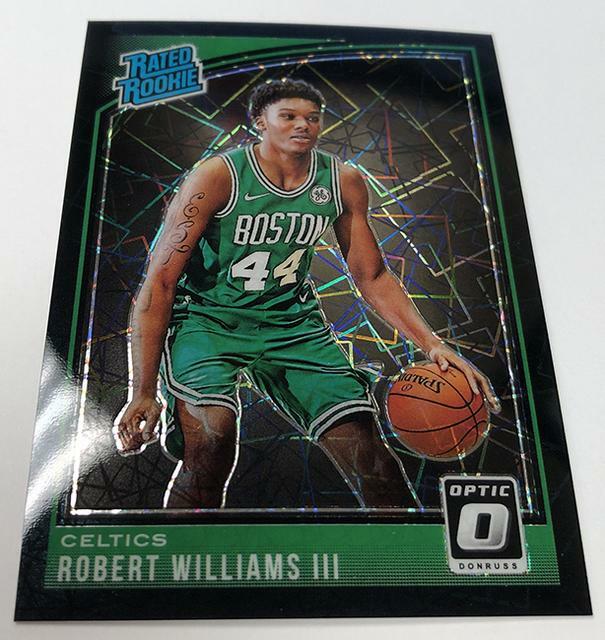 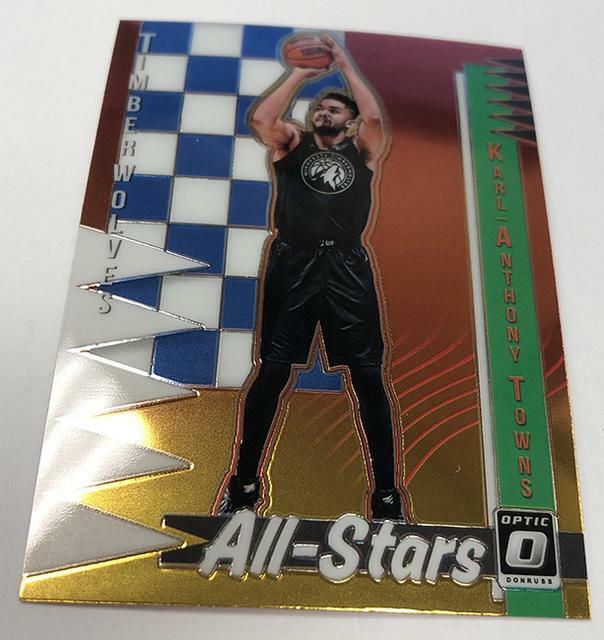 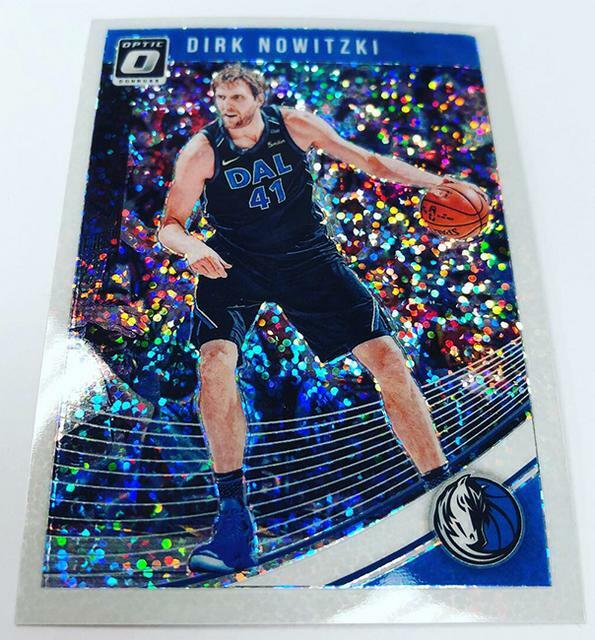 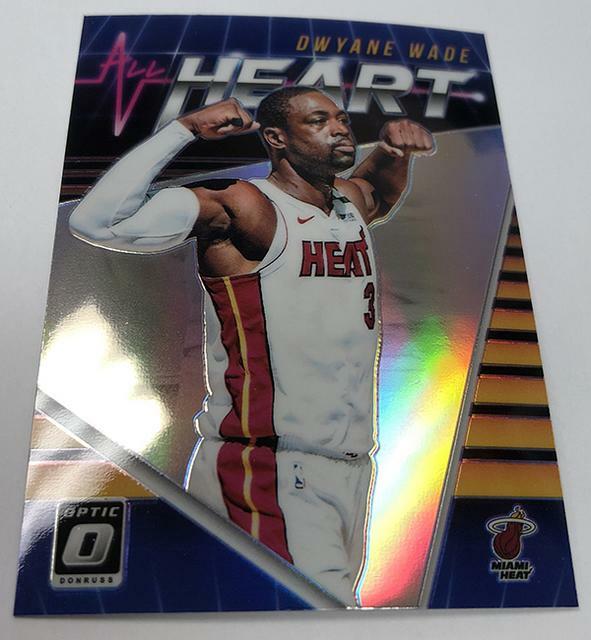 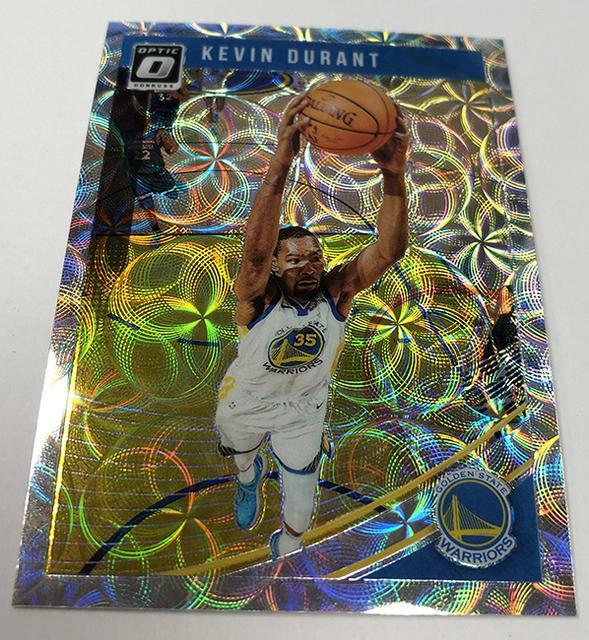 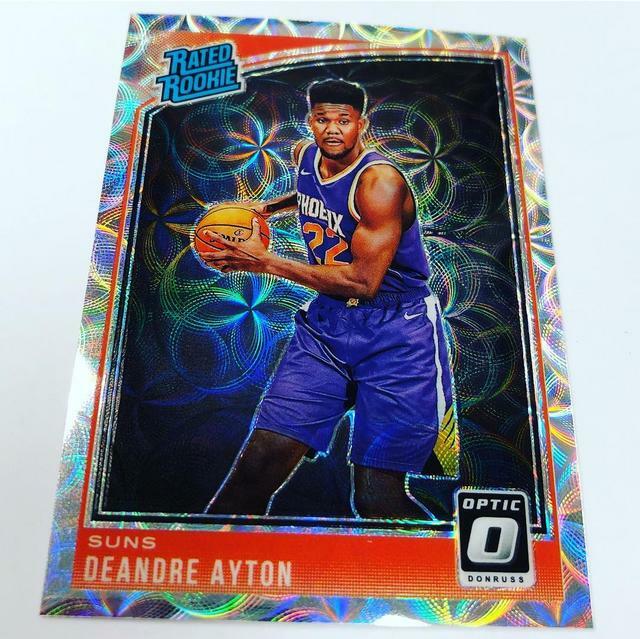 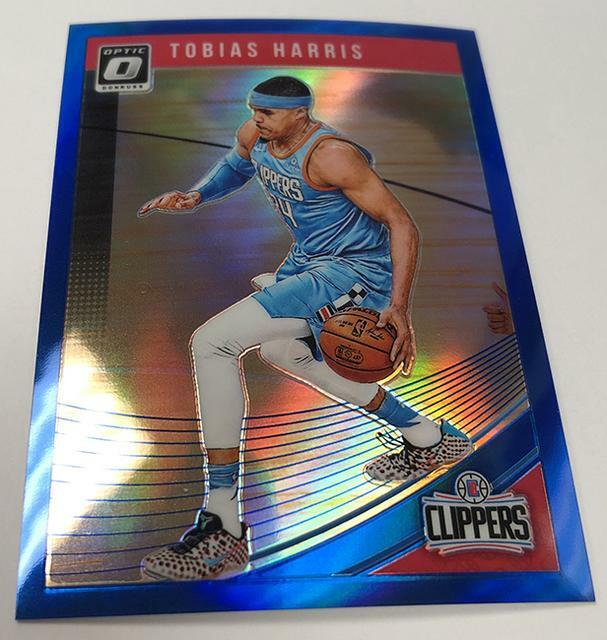 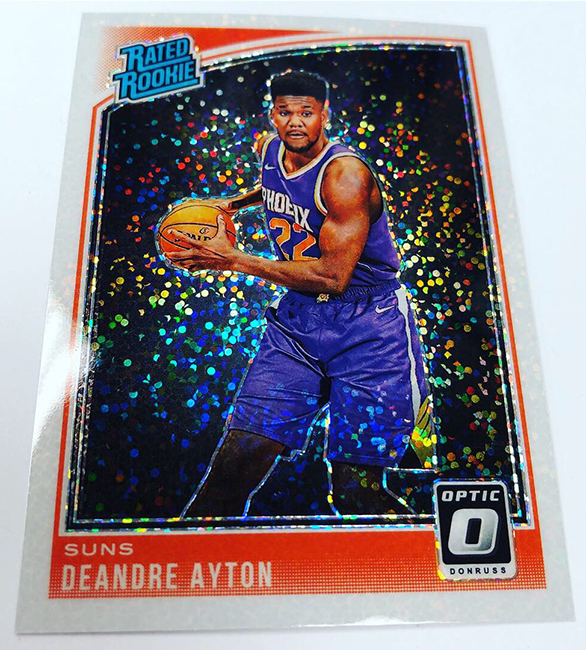 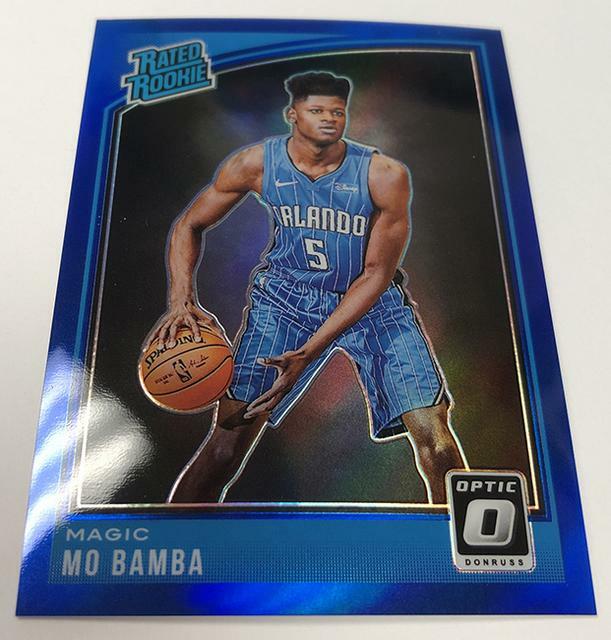 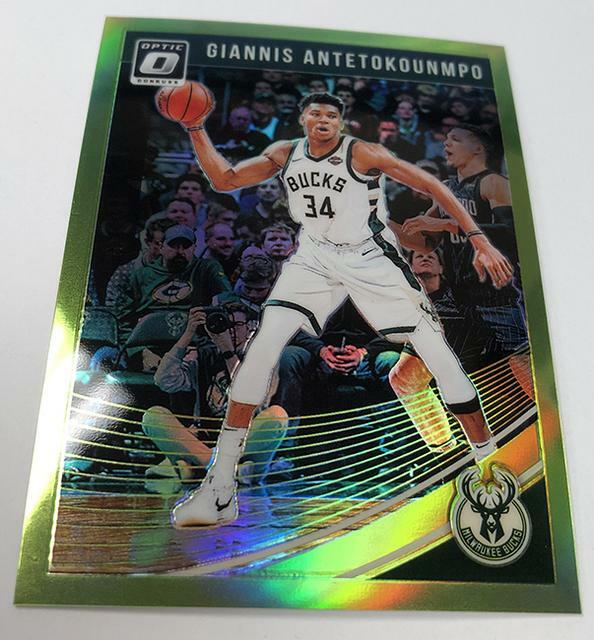 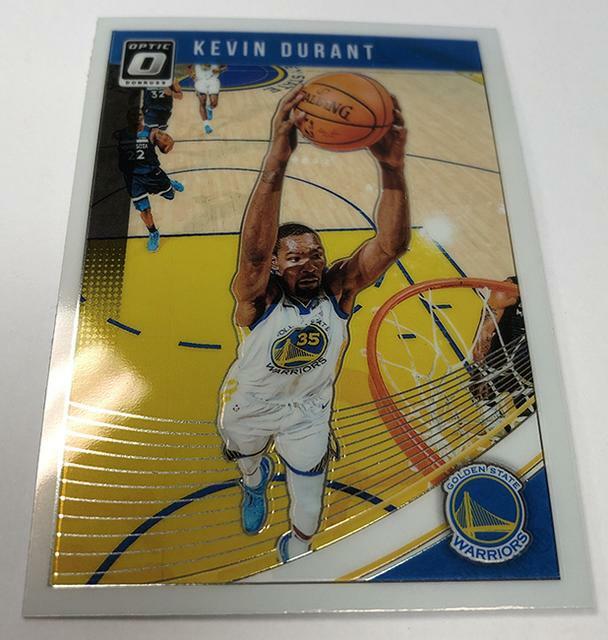 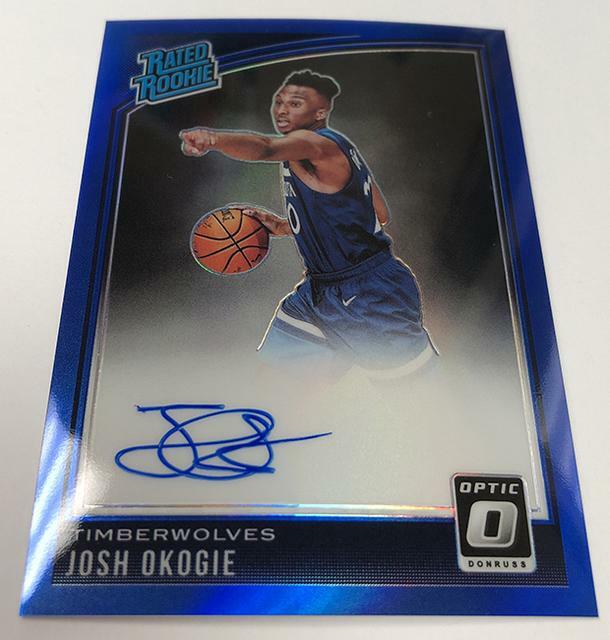 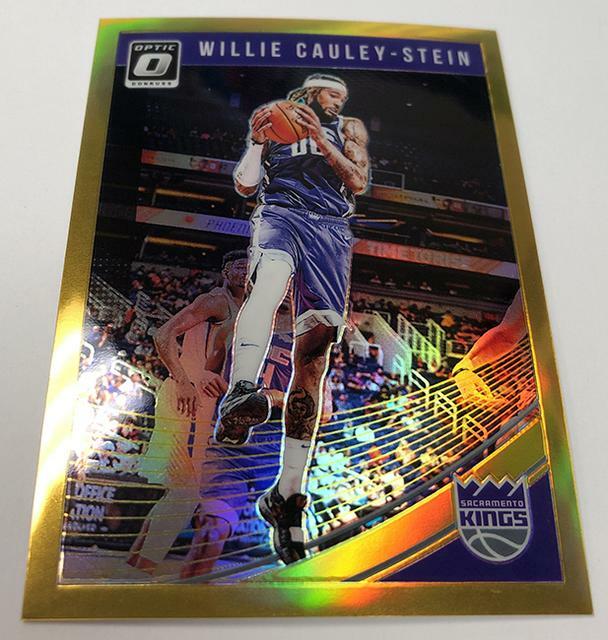 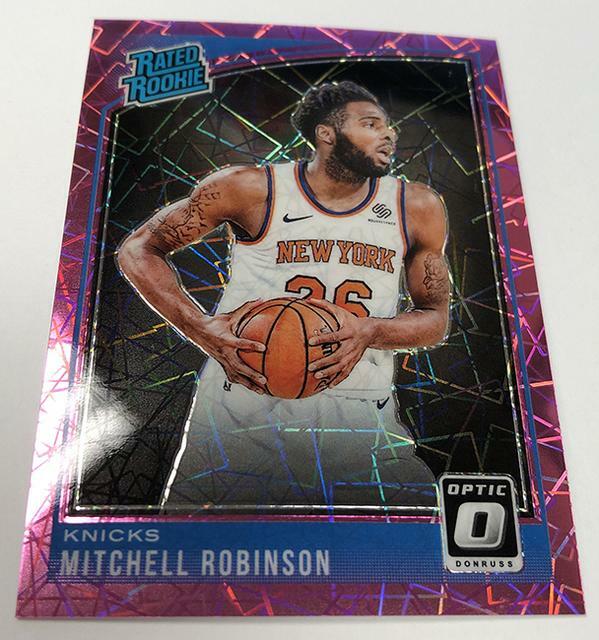 to 2018-19 Donruss Optic . 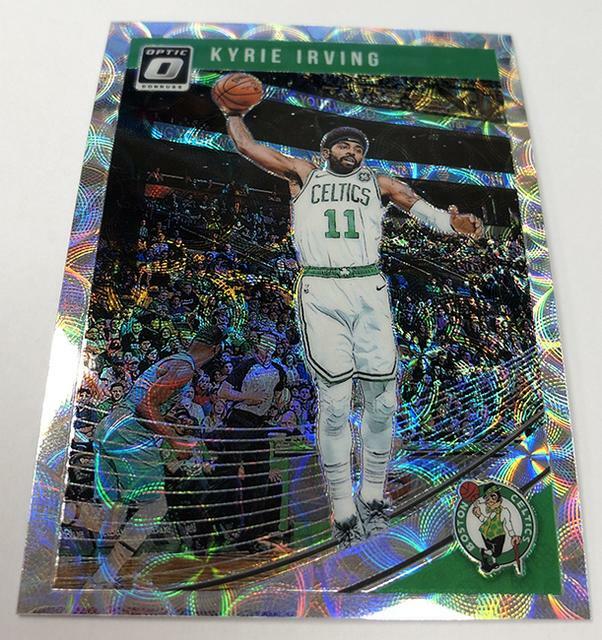 can expect at the box level. 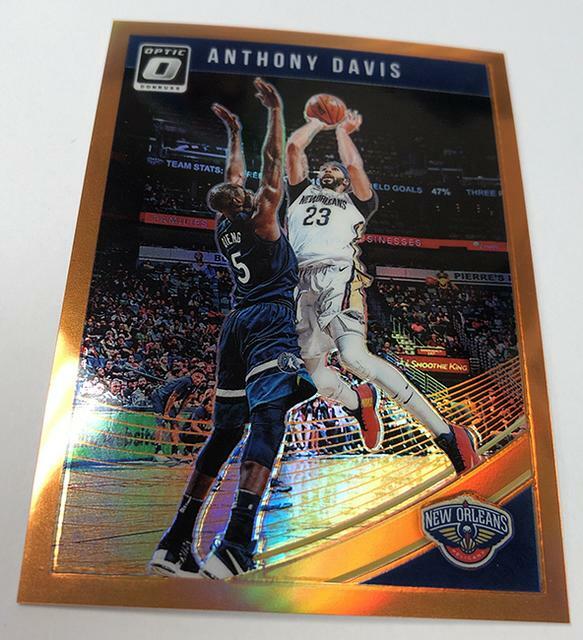 Dernière modification par Eyeshield21 le 13 mars 2019, 13:28, modifié 3 fois. 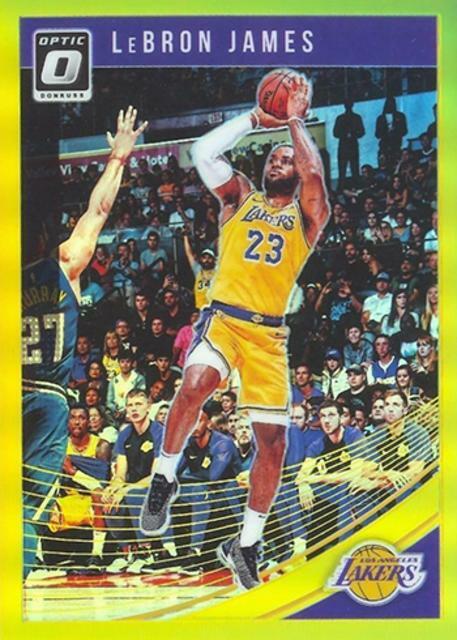 Dernière modification par Eyeshield21 le 09 févr. 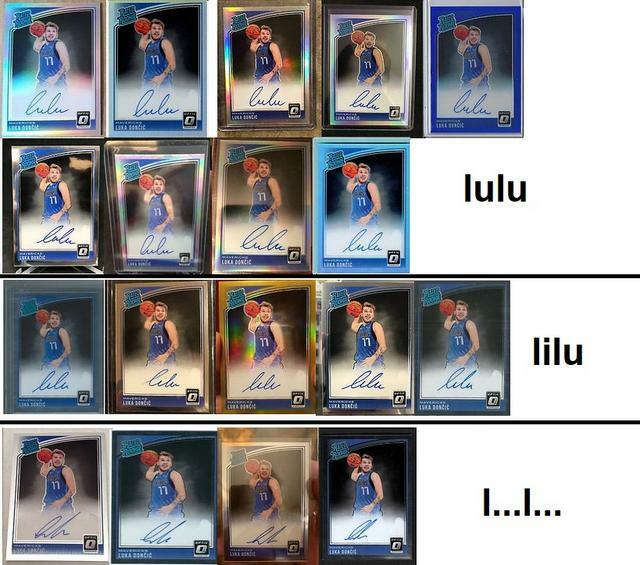 2019, 10:56, modifié 1 fois. 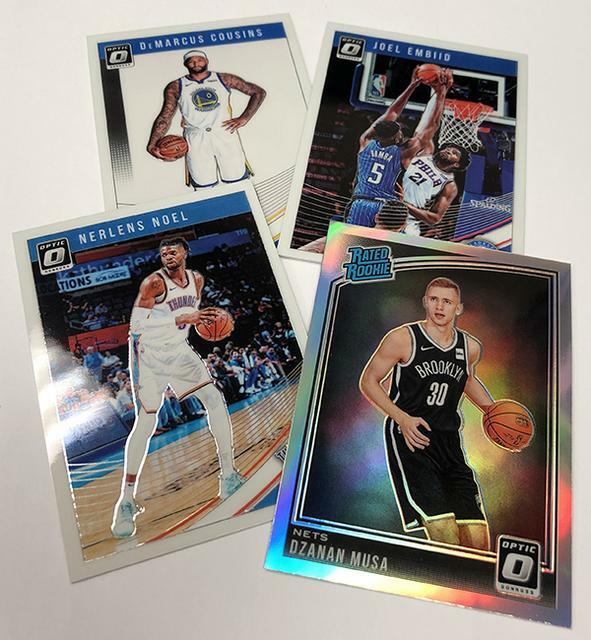 online store of Panini America while supplies last. 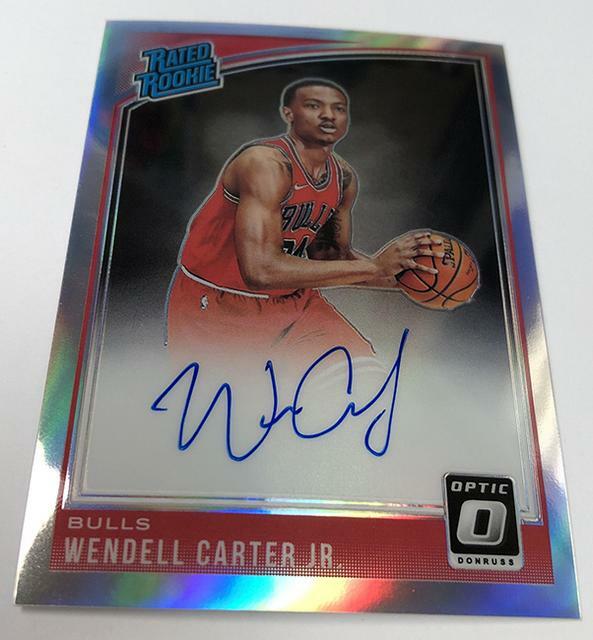 and one Rated Rookie Autograph numbered to just 10.
and is sequentially numbered out of 249. 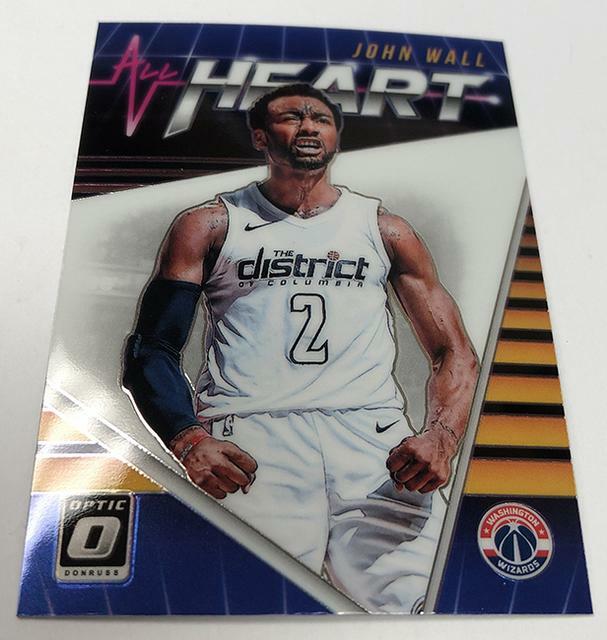 The set will be available only while supplies last. 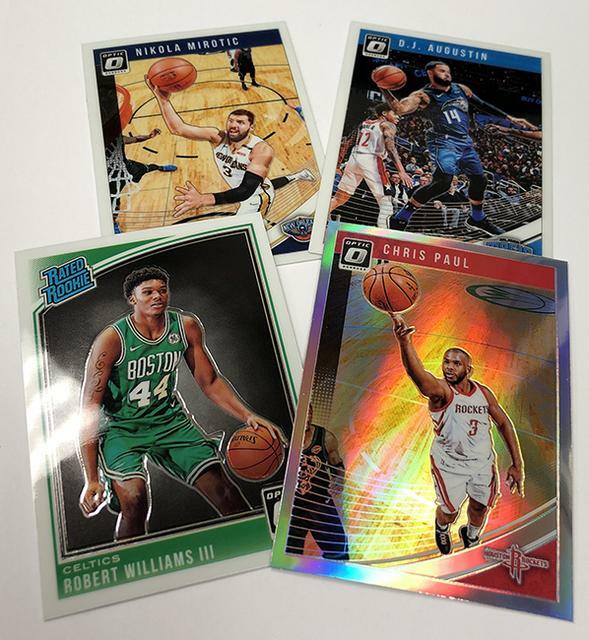 visit the official online store of Panini America. 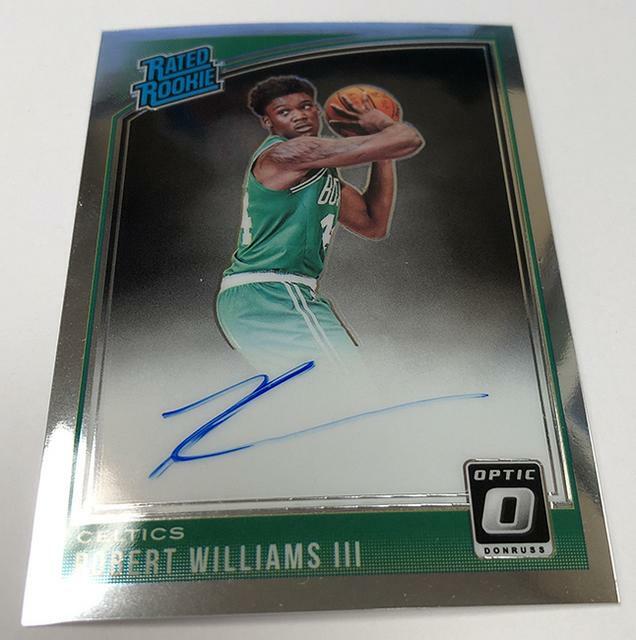 autograph checklist and a brief preview gallery. 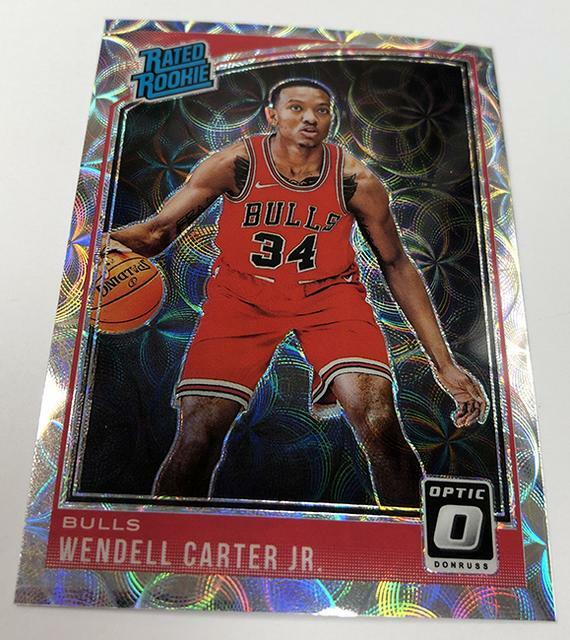 2018-19 Donruss Optic Rated Rookie Premium Box Set WENDELL CARTER Jr.
2018-19 Donruss Optic Rated Rookie Premium Box Set #/249 JAREN JACKSON Jr.
Dernière modification par Eyeshield21 le 13 mars 2019, 11:01, modifié 1 fois. 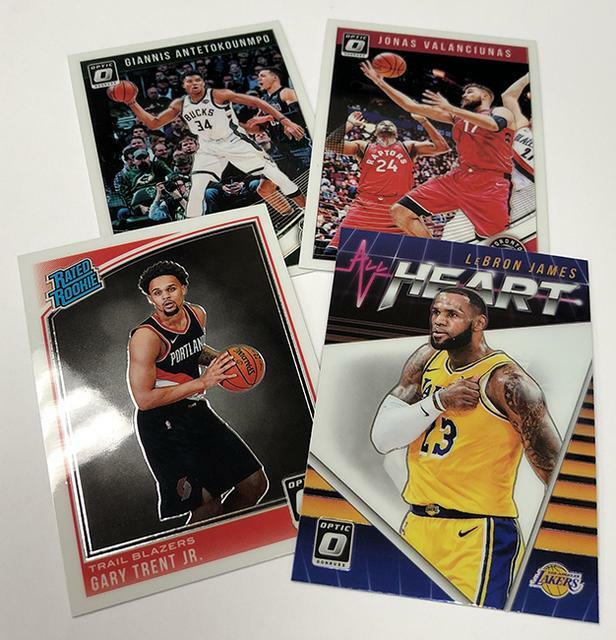 a more upscale and exclusive take on the main set. 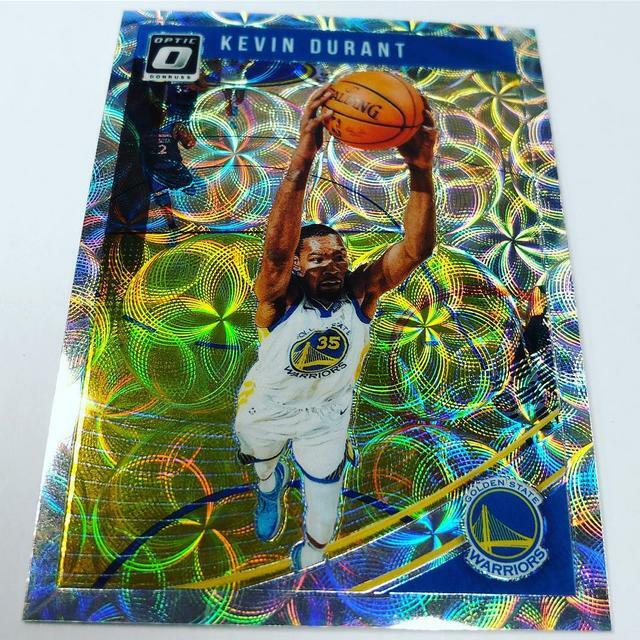 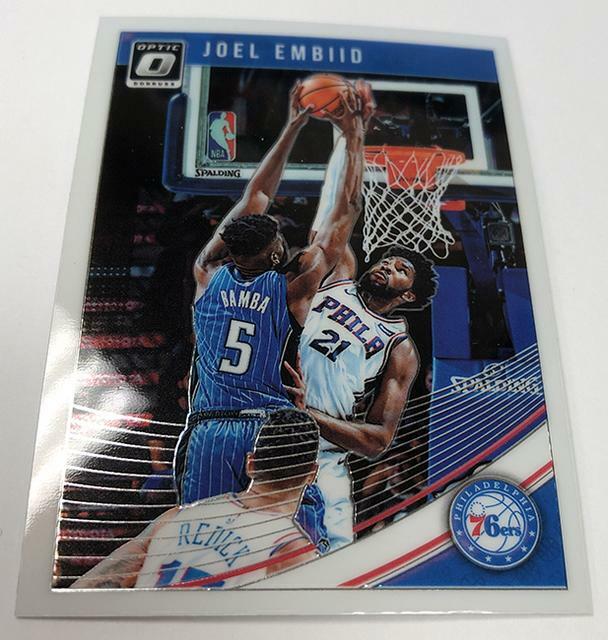 of the 2018-19 Donruss Optic base set. 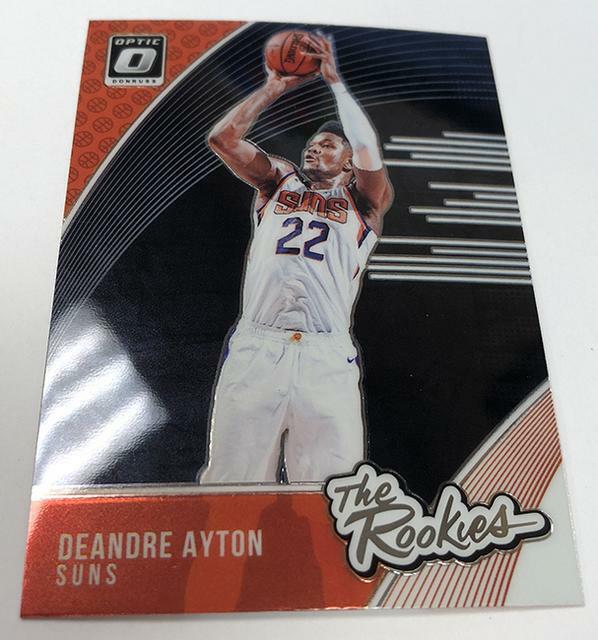 Deandre Ayton and the other 48 Rated Rookies. 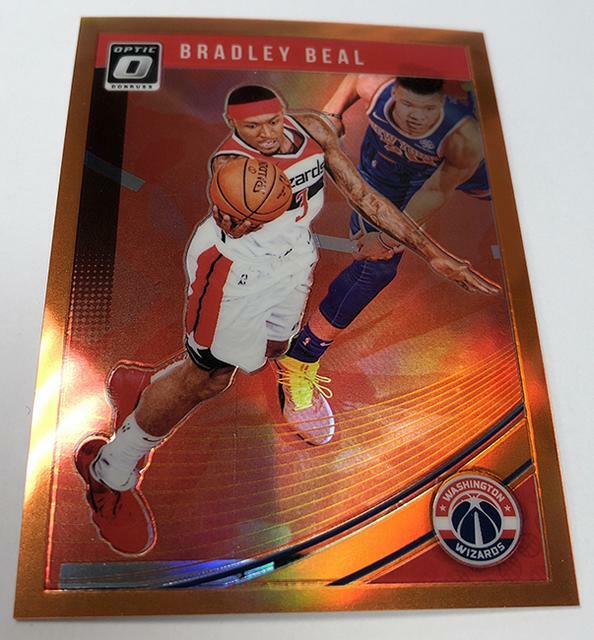 Individual cards come serial numbered to 249.
though. 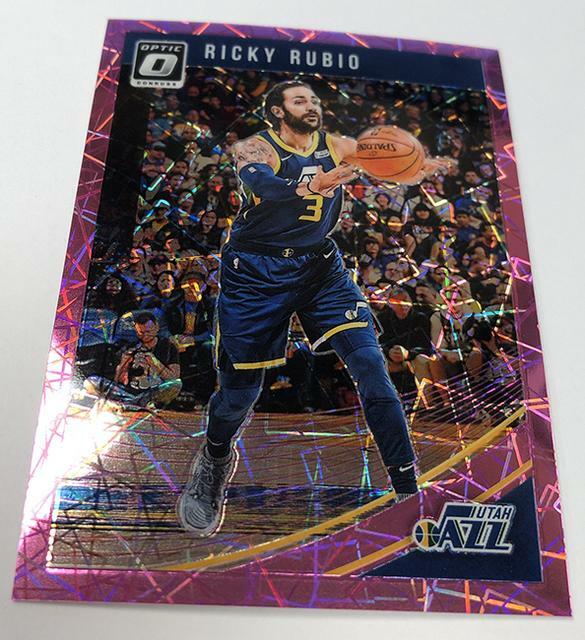 Rather, it’s a mix. 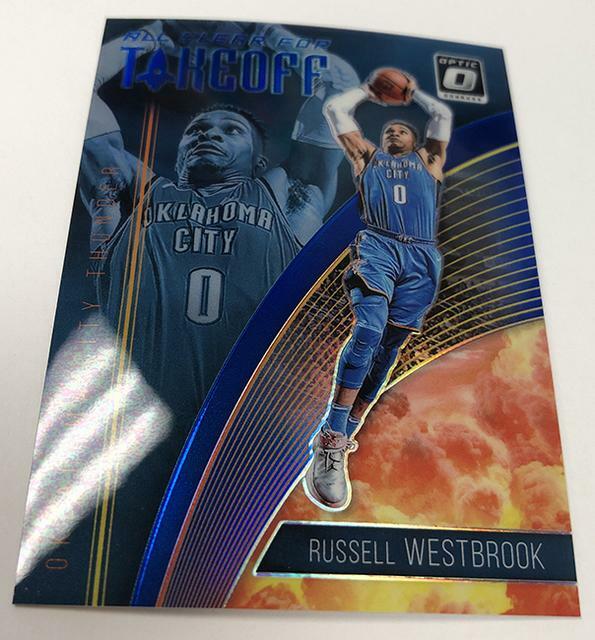 Limited to 25 key players, each is numbered to 10.
from those found in regular packs. 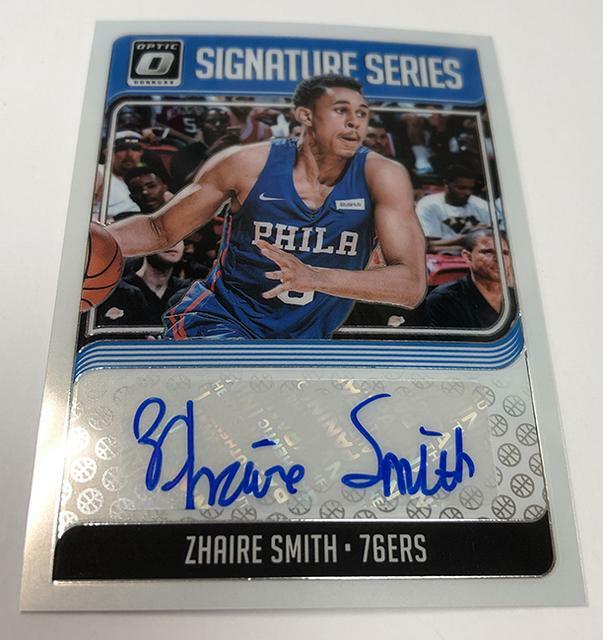 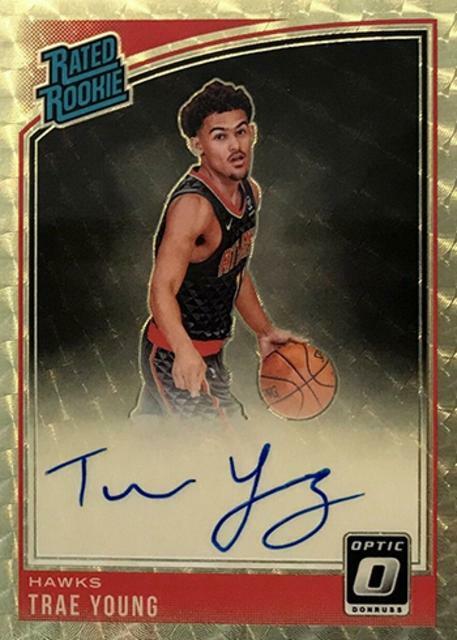 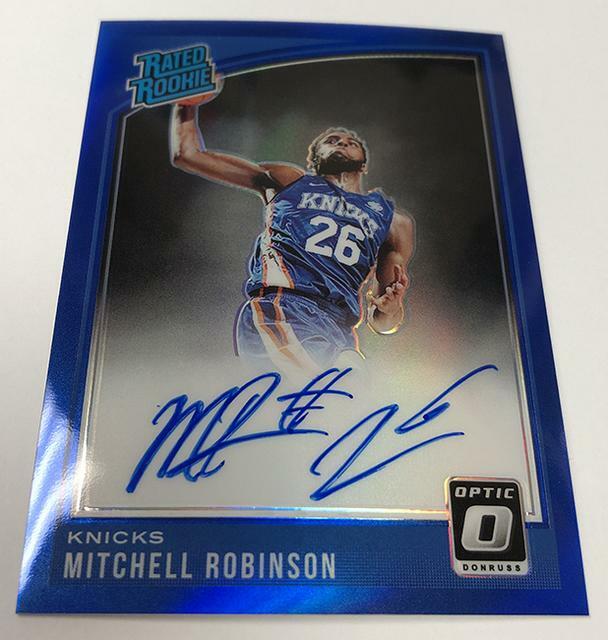 with one low-numbered NBA rookie autograph. 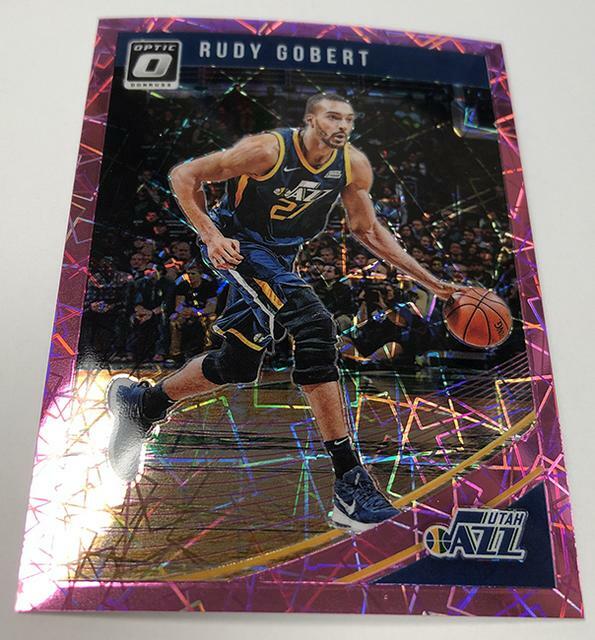 and there are only 249 sets in total. 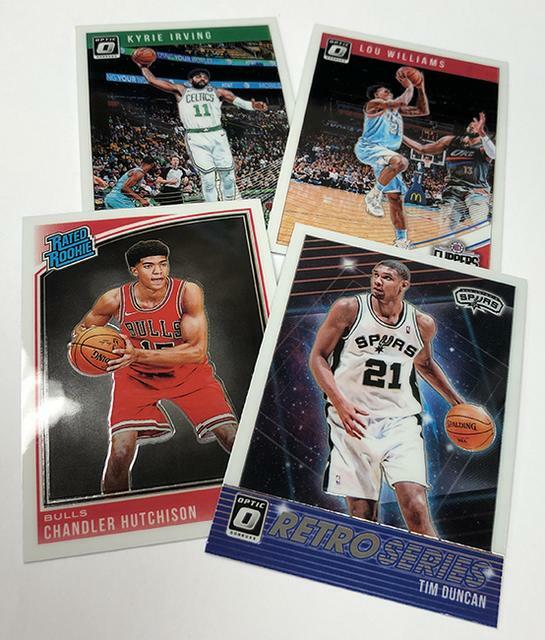 the full 200-card set that includes all 50 Rated Rookie cards. 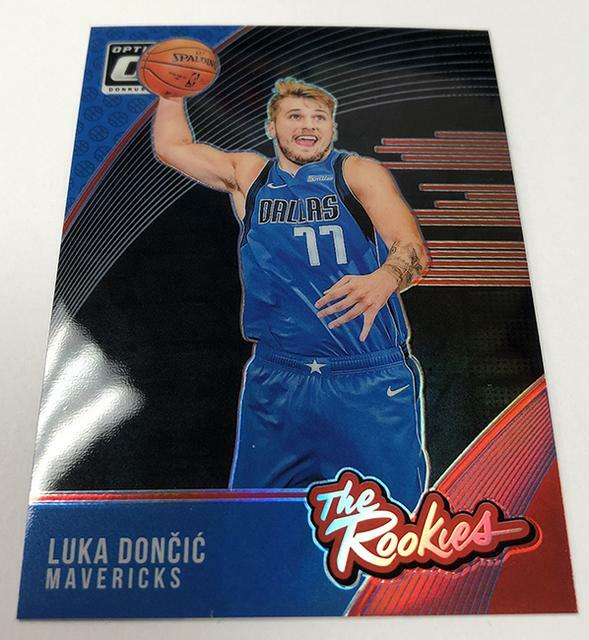 Naturally, Luka Dončić is part of that RC lineup. 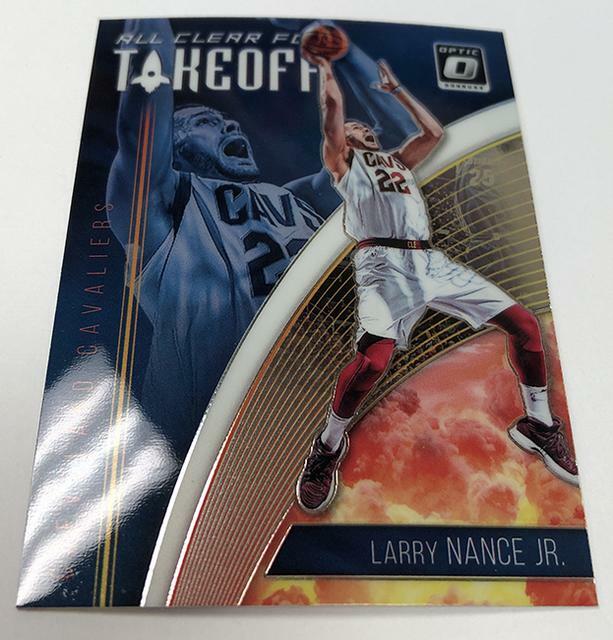 is only available in this format, plus a numbered print run of 249 copies. 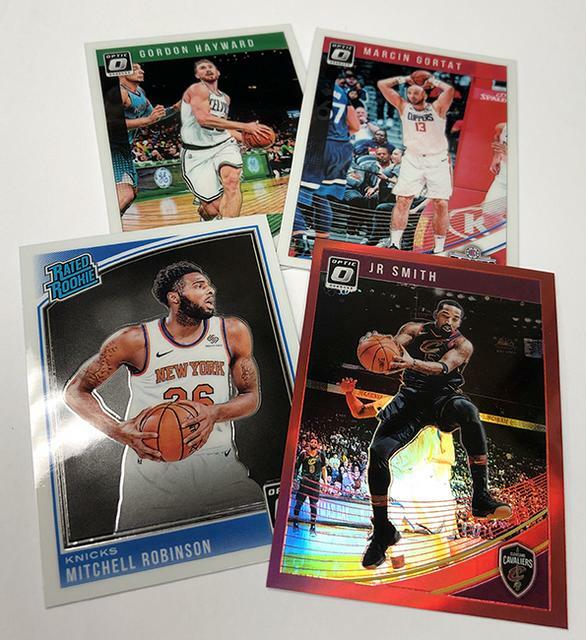 combinations of card #1/249 to #249/249. 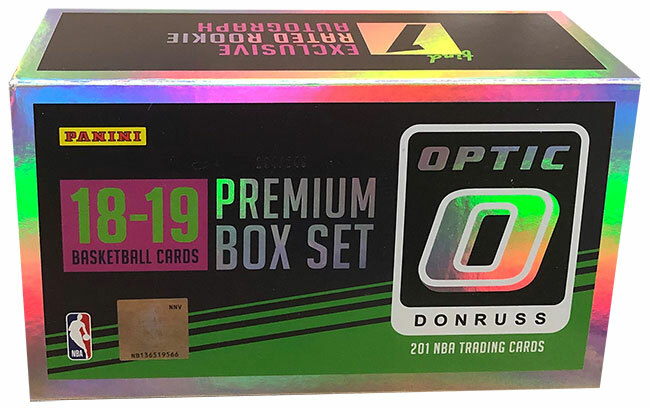 Numbered to only 10, these come one per box. 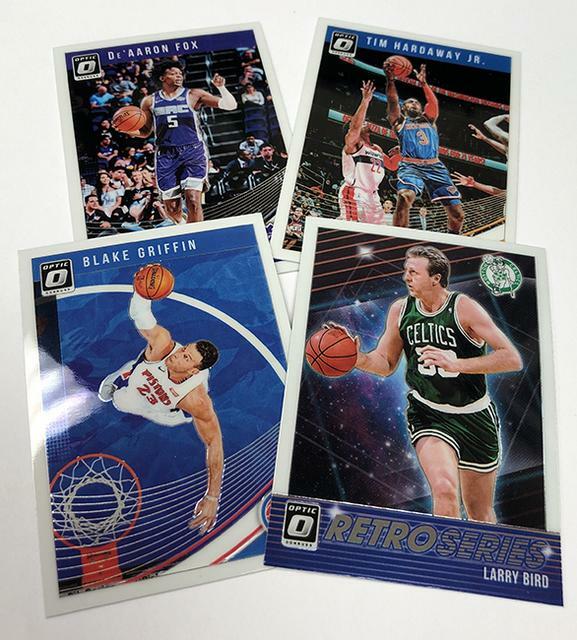 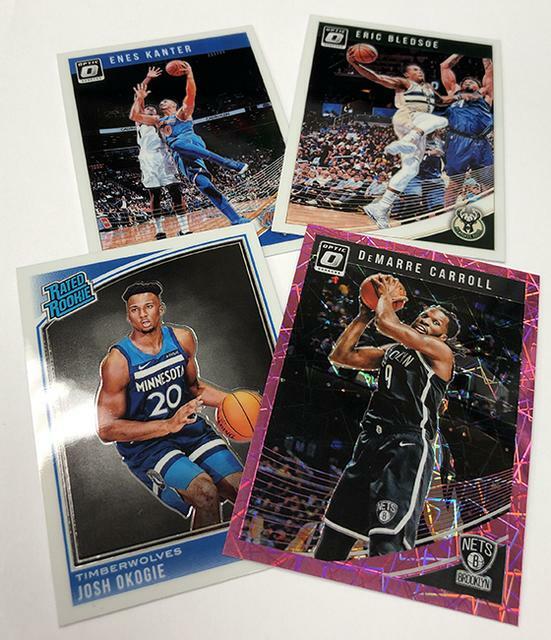 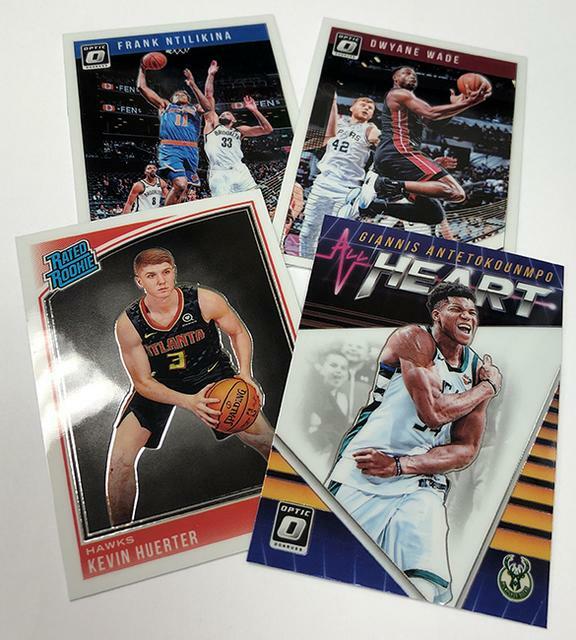 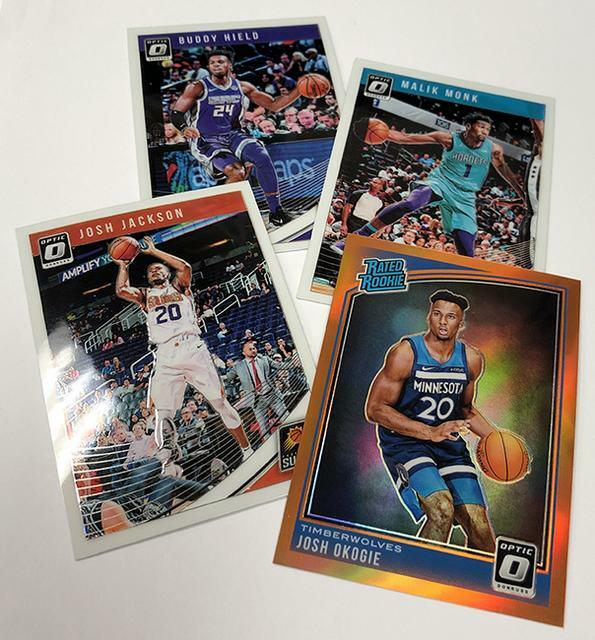 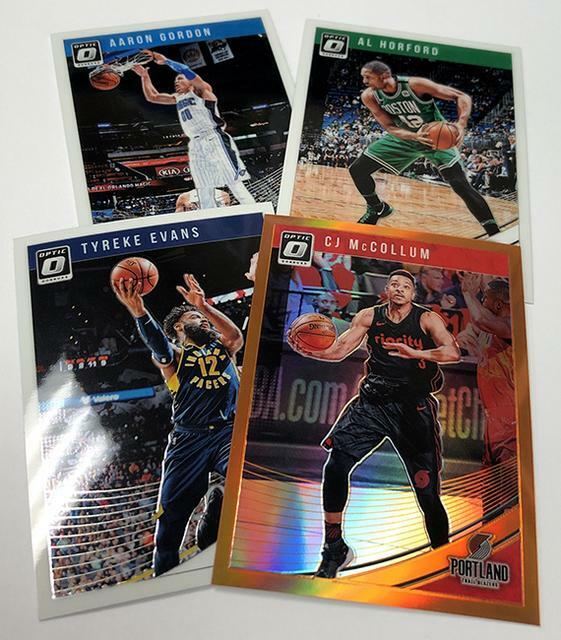 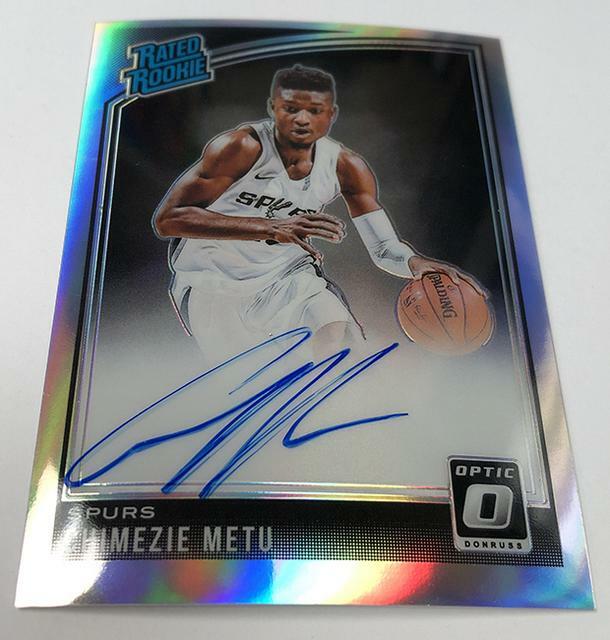 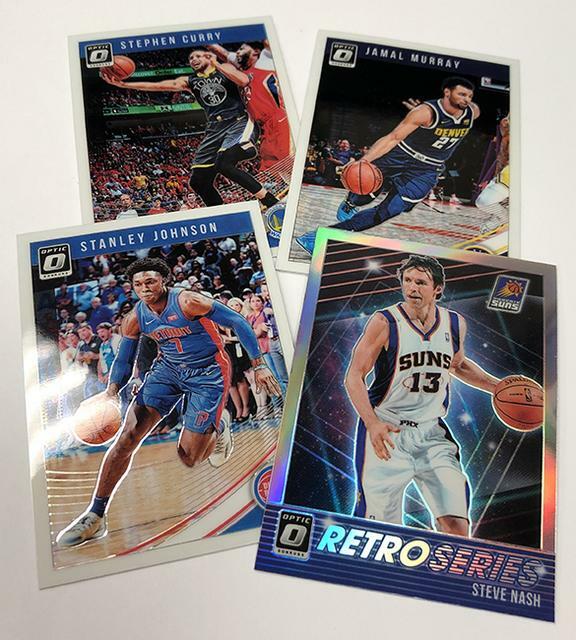 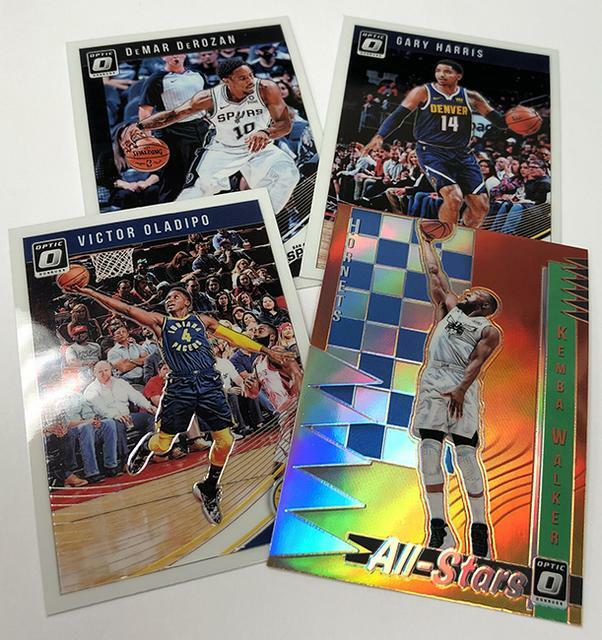 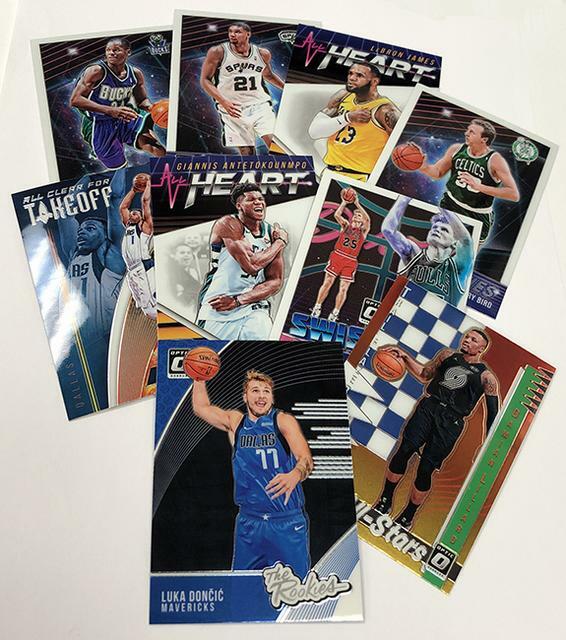 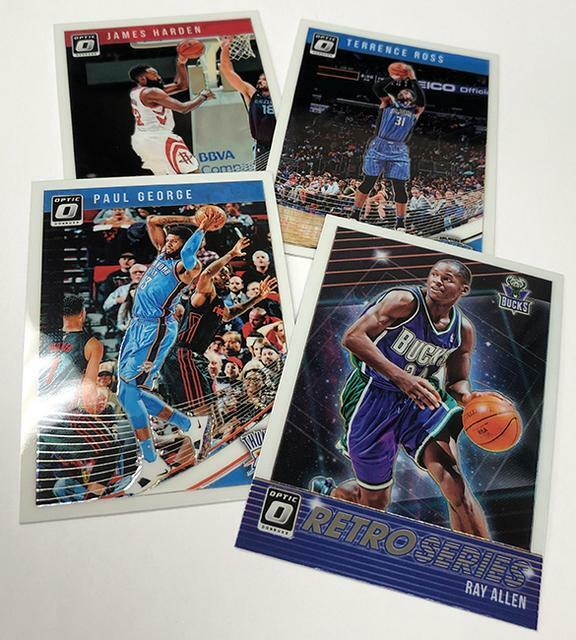 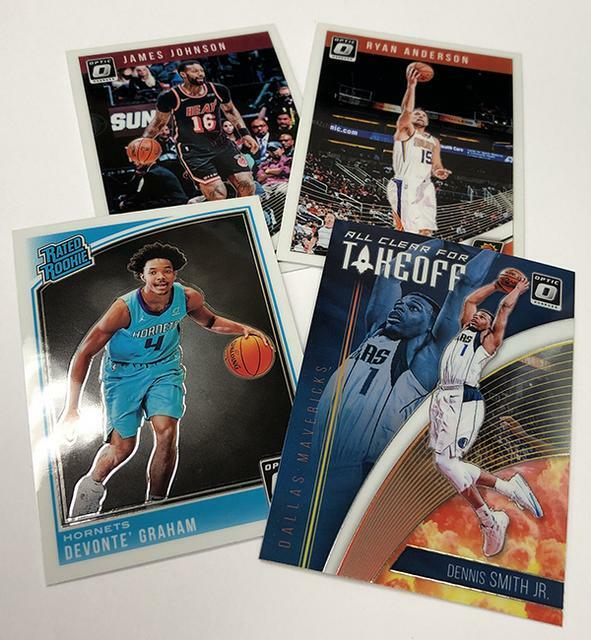 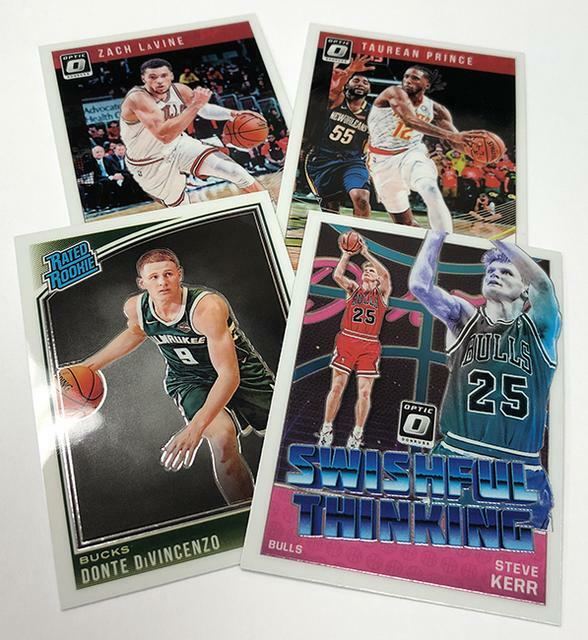 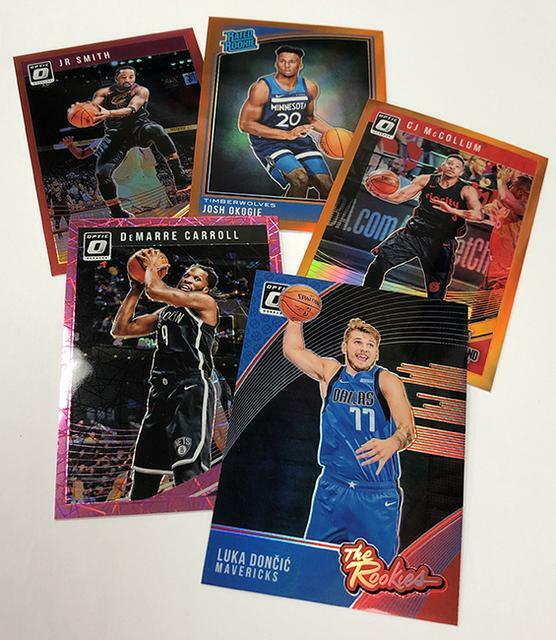 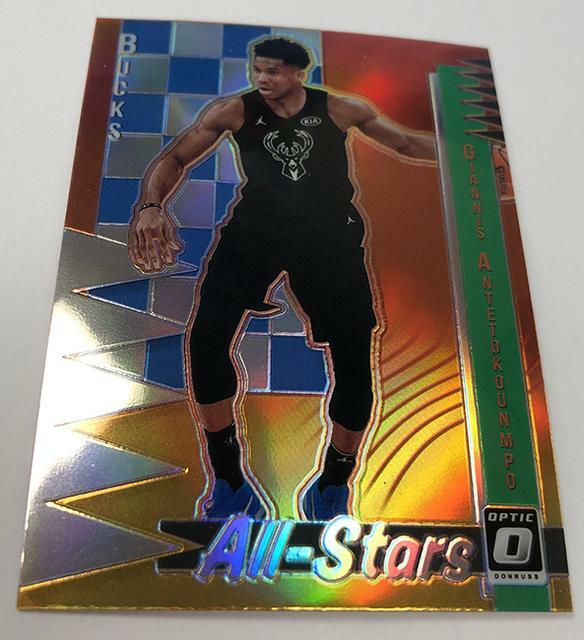 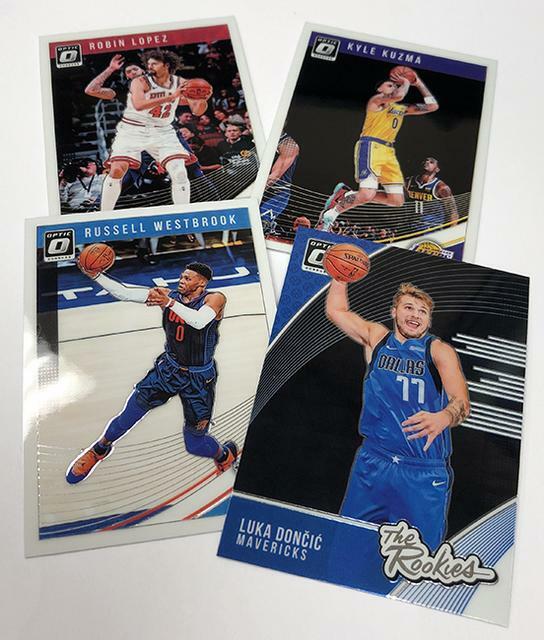 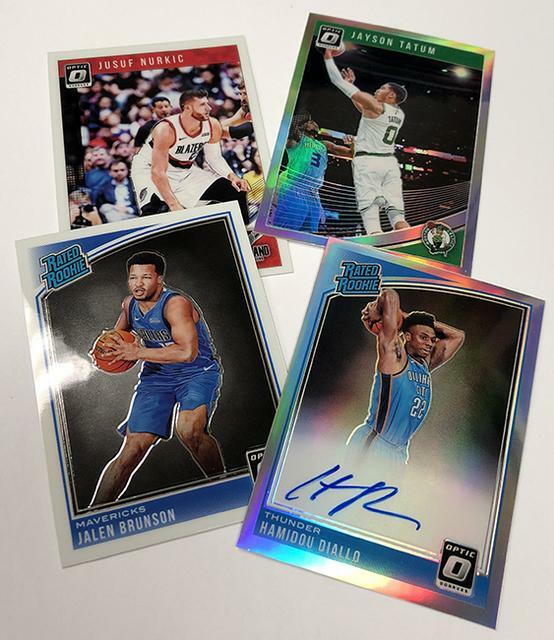 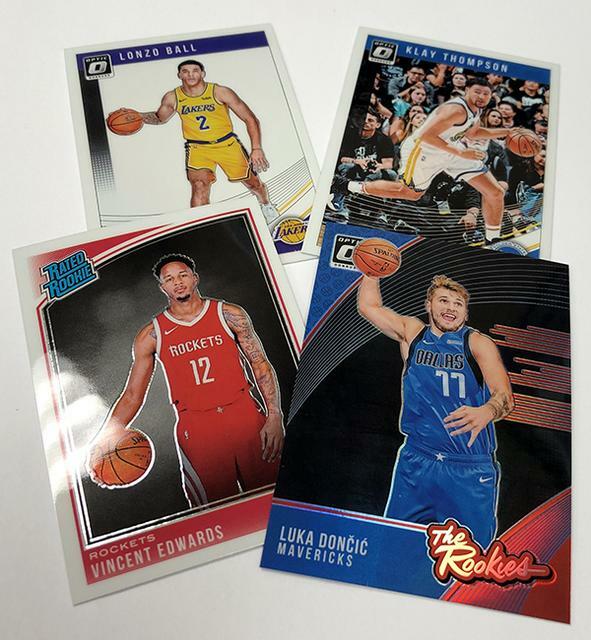 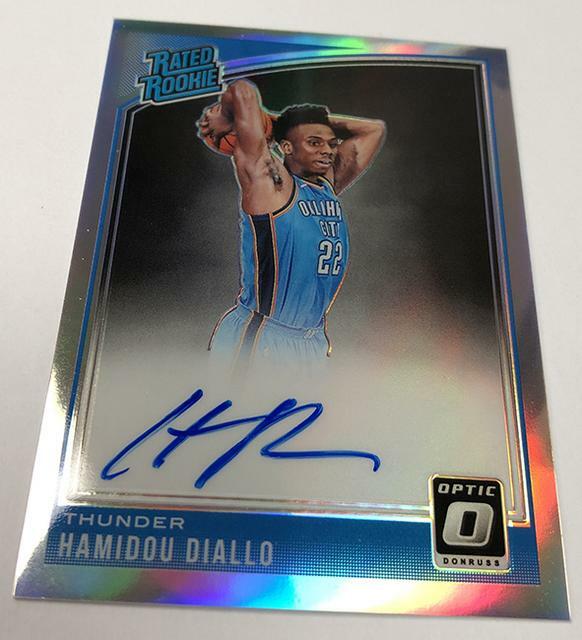 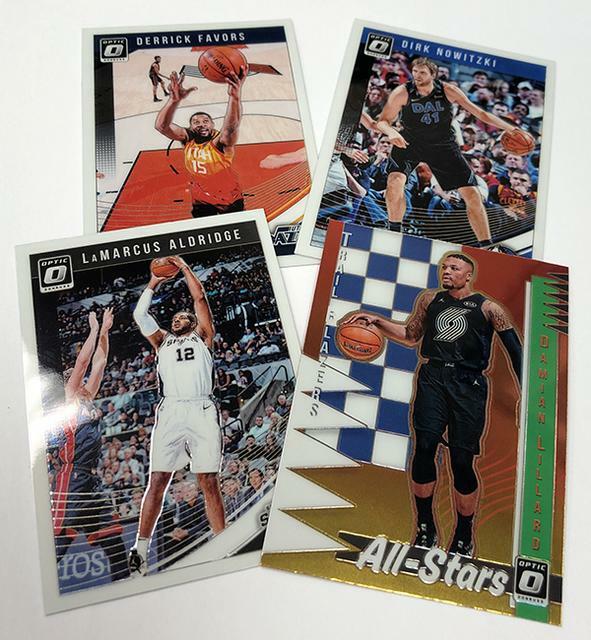 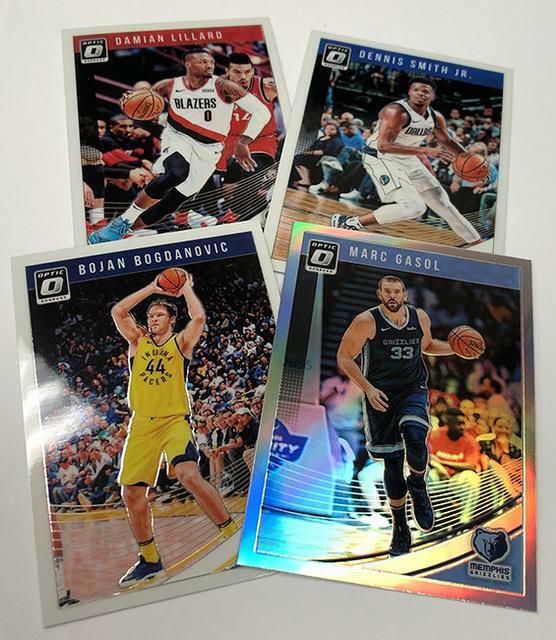 2018-19 Donruss Optic Premium Box Set #10 Dennis Smith Jr.
2018-19 Donruss Optic Premium Box Set #67 Tim Hardaway Jr.
2018-19 Donruss Optic Premium Box Set #123 Otto Porter Jr.
2018-19 Donruss Optic Premium Box Set Rated Rookie #153 Melvin Frazier Jr.
2018-19 Donruss Optic Premium Box Set Rated Rookie #170 Wendell Carter Jr.
2018-19 Donruss Optic Premium Box Set Rated Rookie #182 Michael Porter Jr.
2018-19 Donruss Optic Premium Box Set Rated Rookie #188 Jaren Jackson Jr.
2018-19 Donruss Optic Premium Box Set Rated Rookie #192 Troy Brown Jr.
2018-19 Donruss Optic Premium Box Set Rated Rookie #199 Gary Trent Jr.
2018-19 Donruss Optic Rated Rookies Premium Box Signatures #170 Wendell Carter Jr.
2018-19 Donruss Optic Rated Rookies Premium Box Signatures #182 Michael Porter Jr.
2018-19 Donruss Optic Rated Rookies Premium Box Signatures #188 Jaren Jackson Jr.
2018-19 Donruss Optic Rated Rookies Premium Box Signatures #192 Troy Brown Jr.
and on-card Rated Rookie Autographs, remains a hobby favorite. 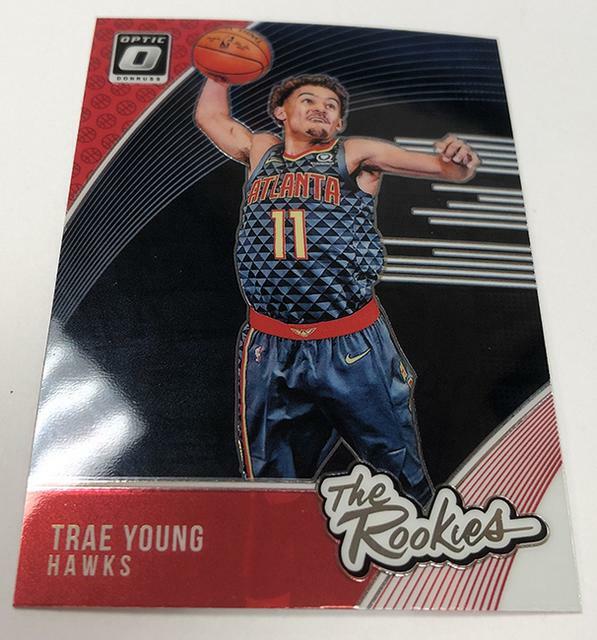 Young has been coming on of late. 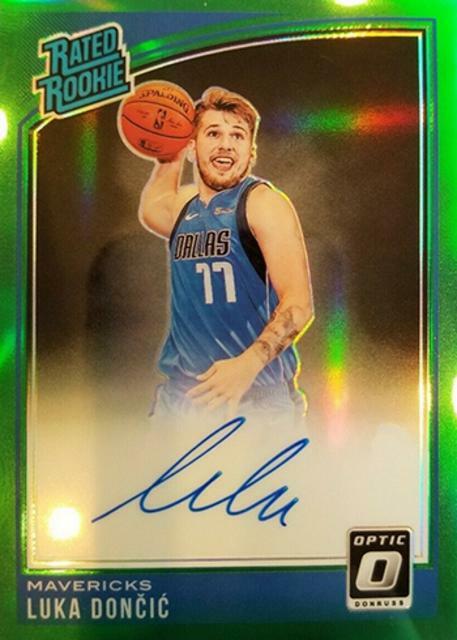 not named Luka Dončić . 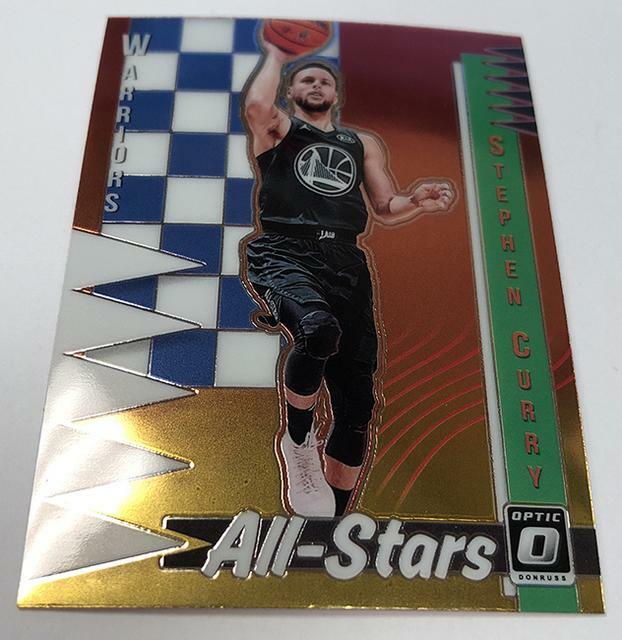 and this Gold Vinyl one-of-one is the most exclusive version. 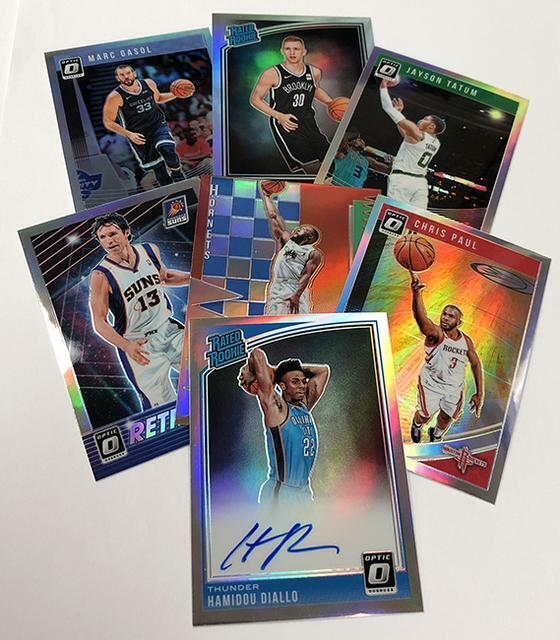 another group of tough-to-pull first-year player signatures. 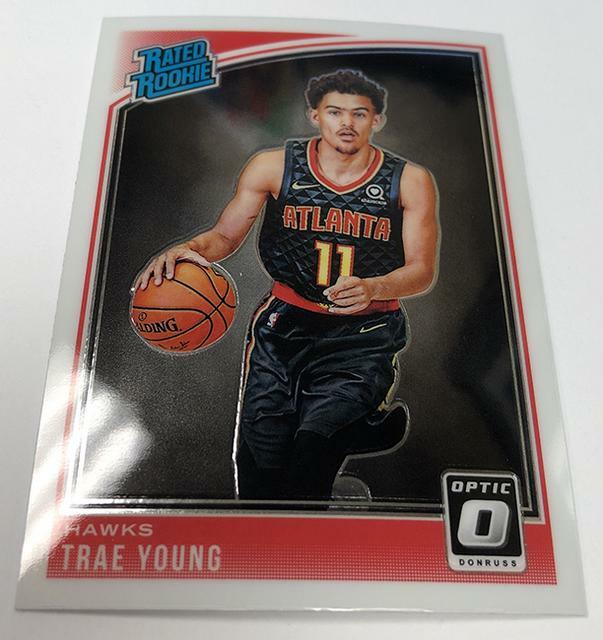 his torrid play for the remainder of his rookie season. 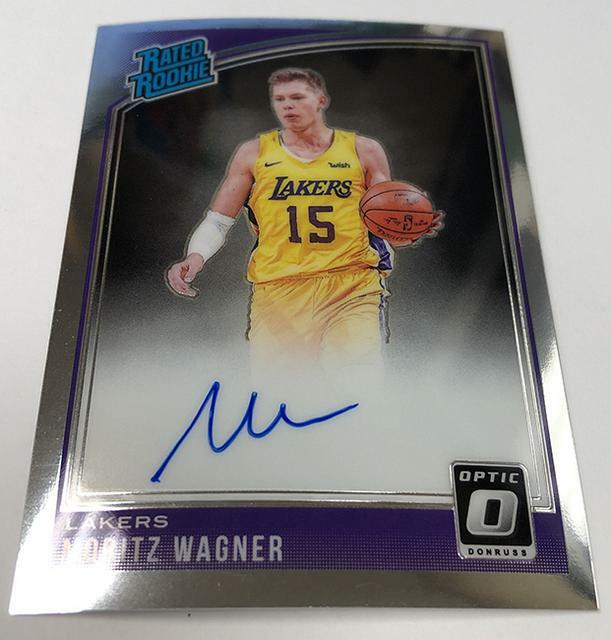 in a Lakers uniform are proving popular. 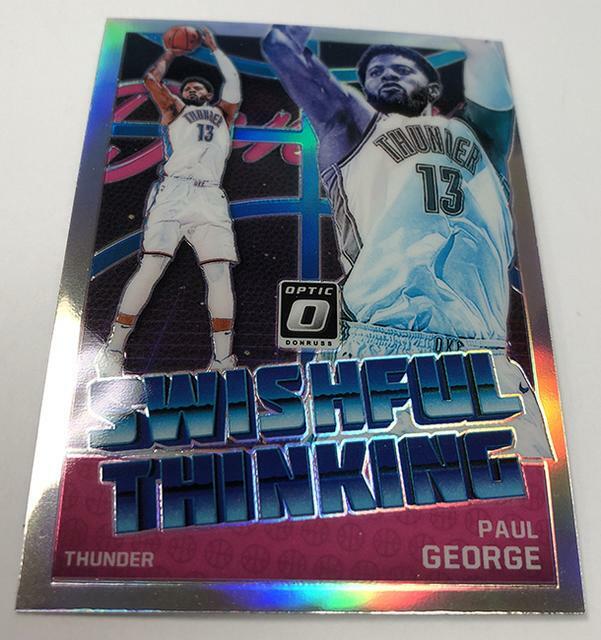 this card easily topping the $1000 mark comes as no surprise. 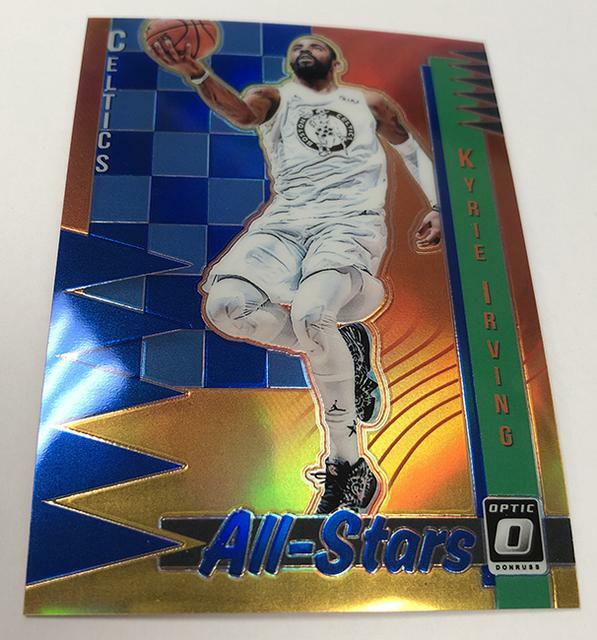 about to get a whole lot more rewarding. 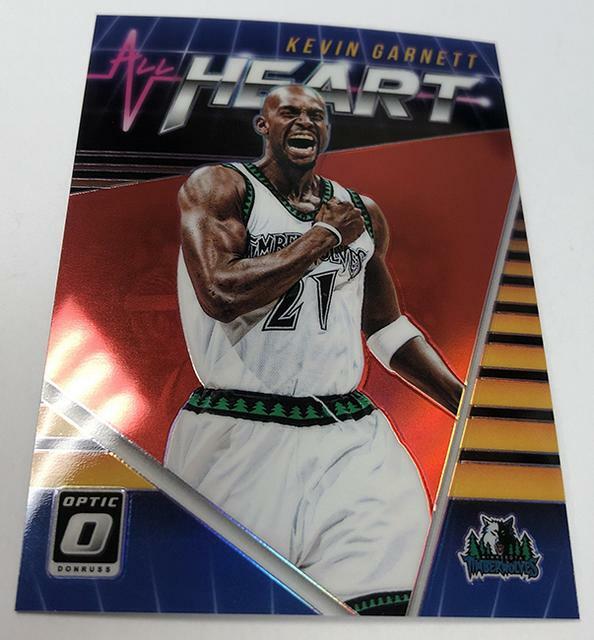 that will be available only while supplies last. 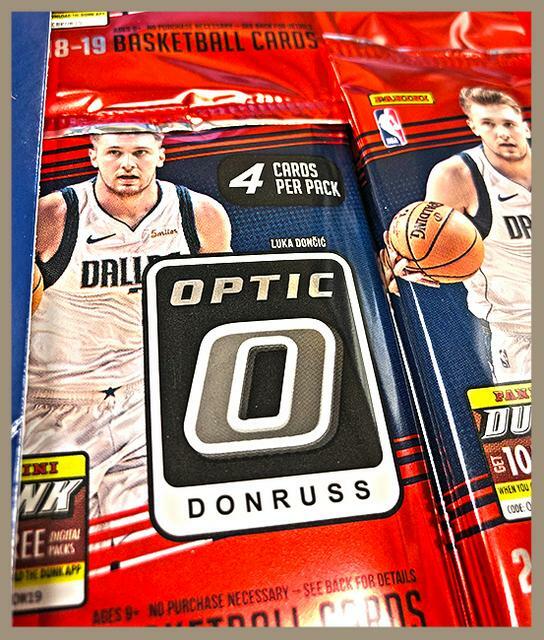 supplies last at a rate of 1,000 Rewards points per pack. 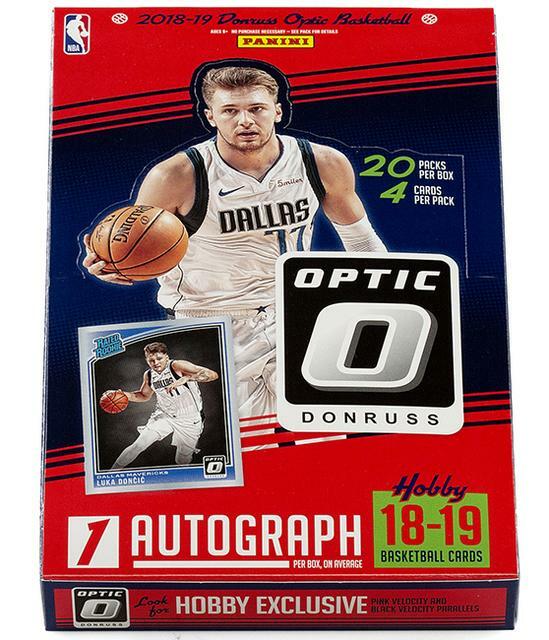 per household per day while supplies last. We provide a brief sneak peek in the gallery that follows.